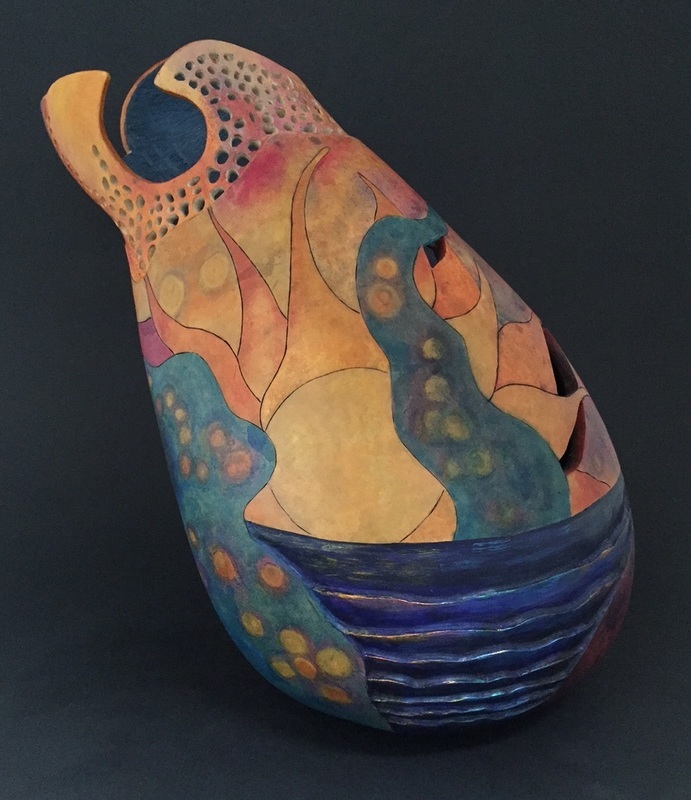 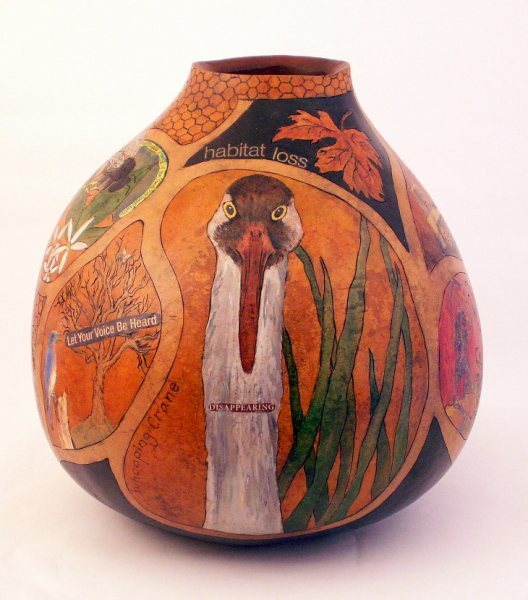 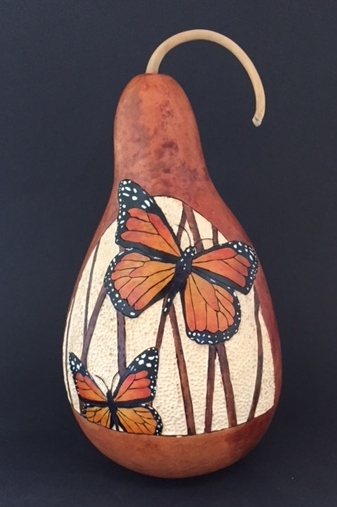 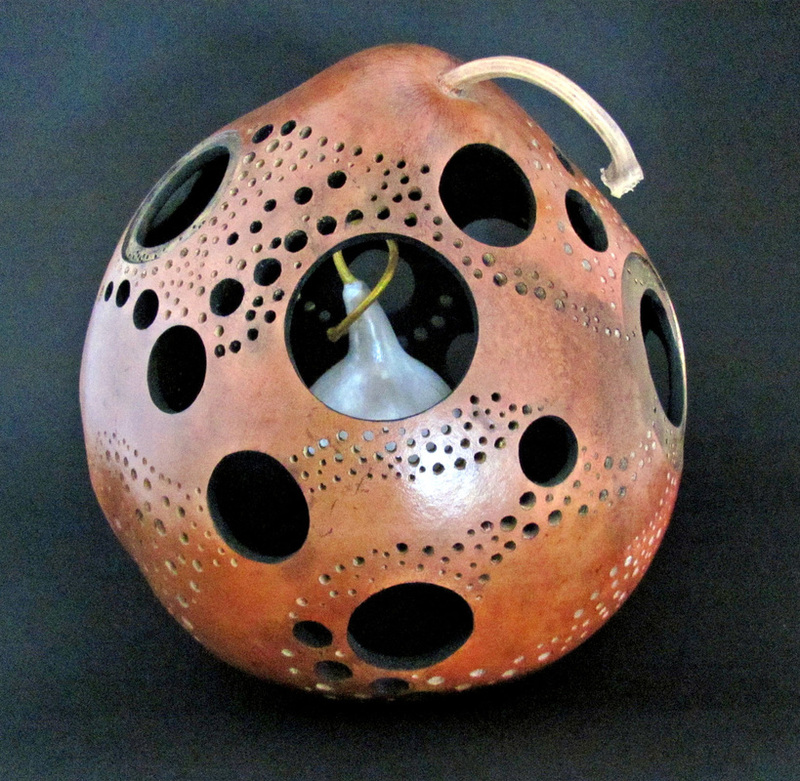 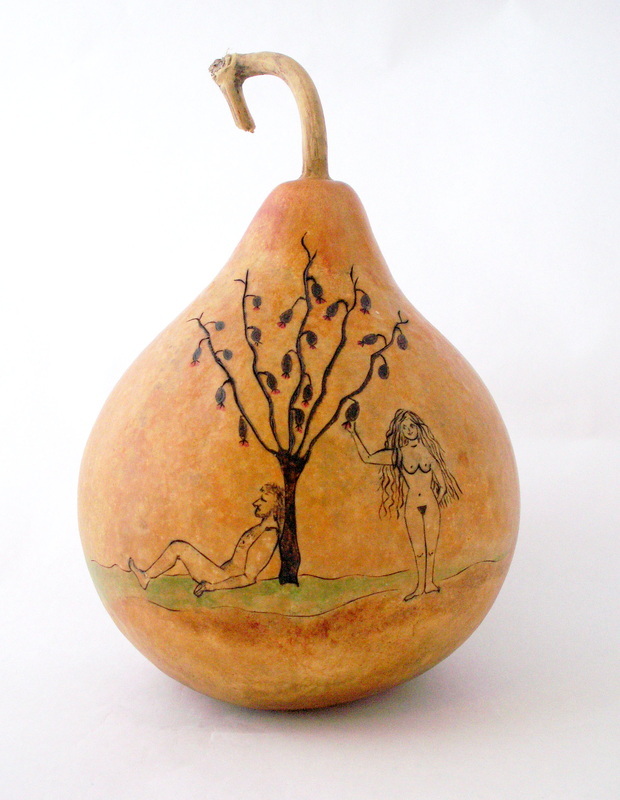 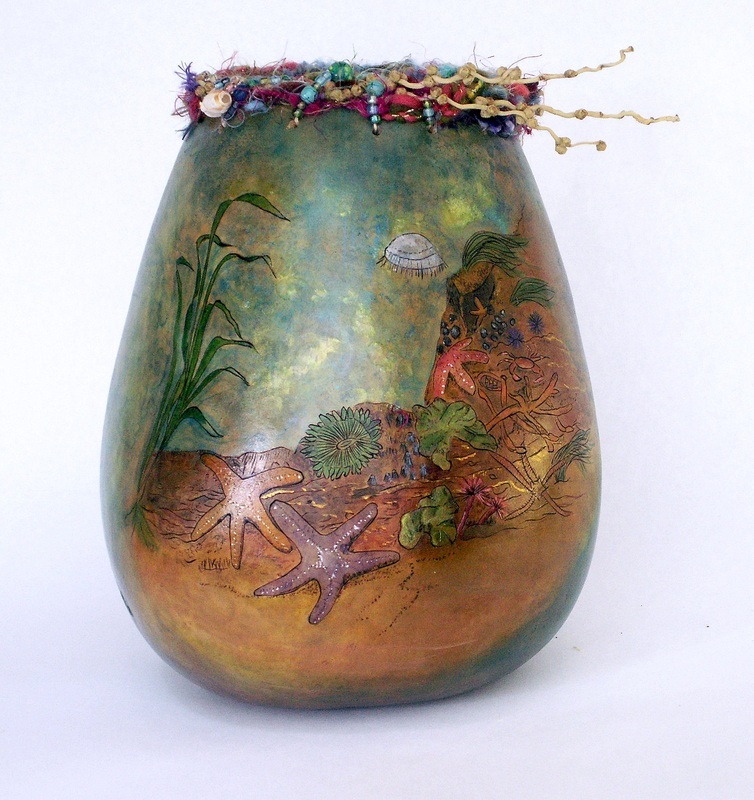 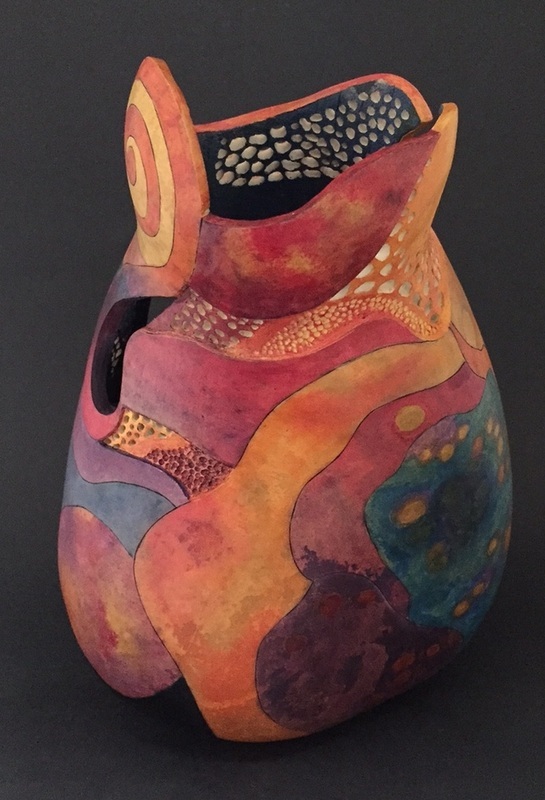 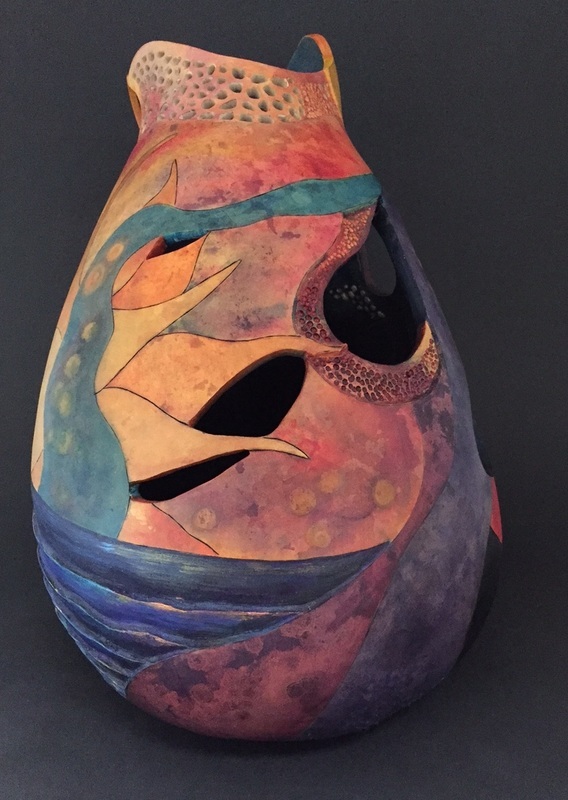 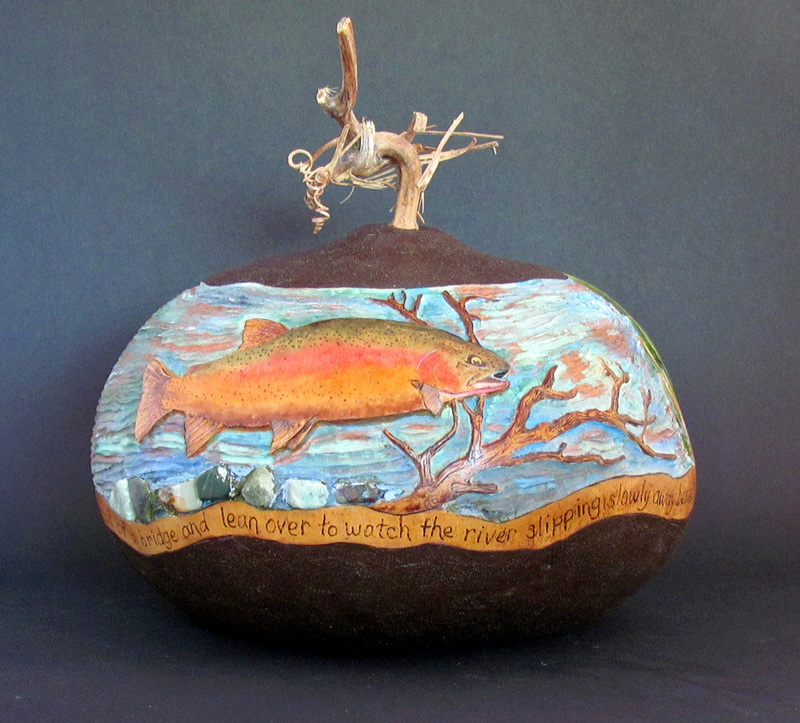 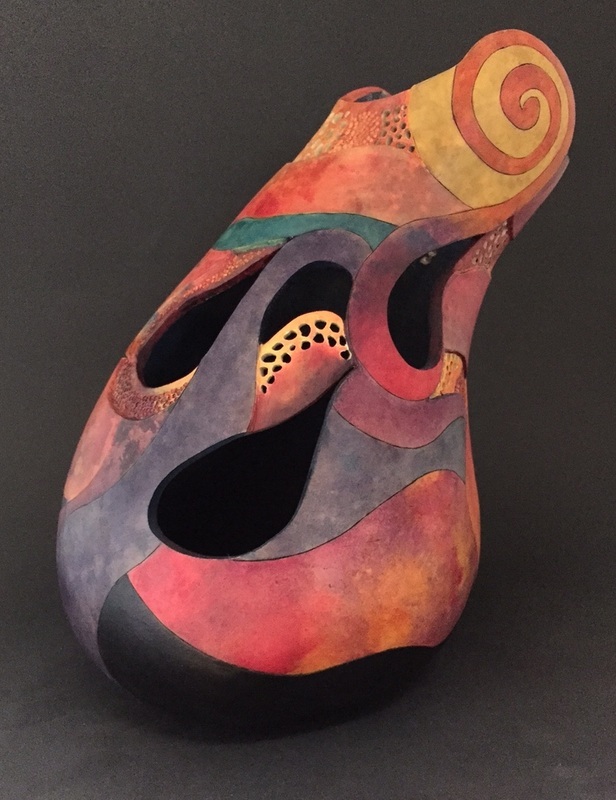 Created especially for The Arts Colony's Dusk to Dawn Show, and winner of the Best of Theme award, this gourd's interesting natural shape presented a fun and interesting design challenge. 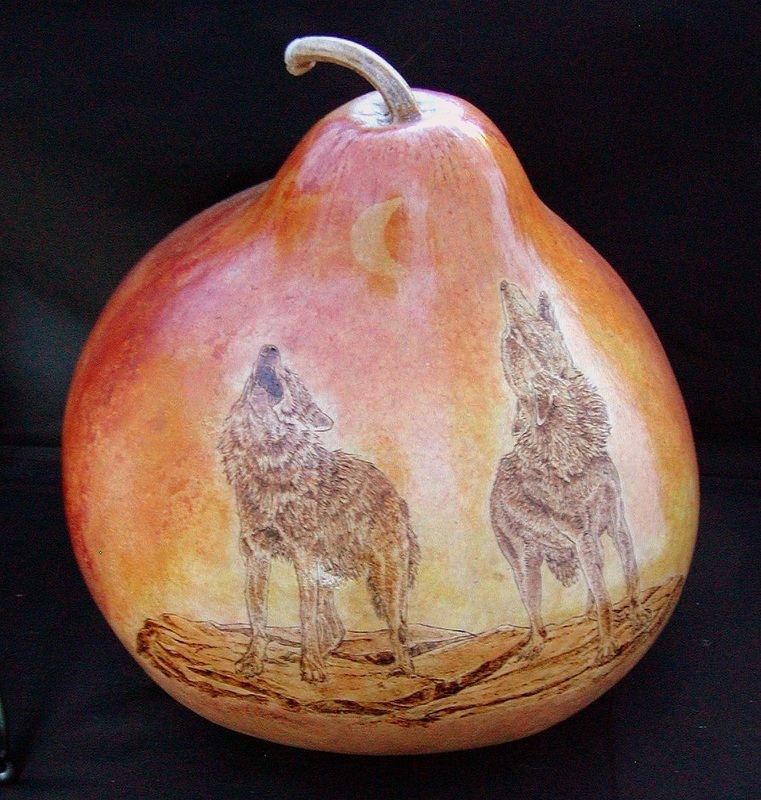 Pyrographed, painted and carved. 12" tall. 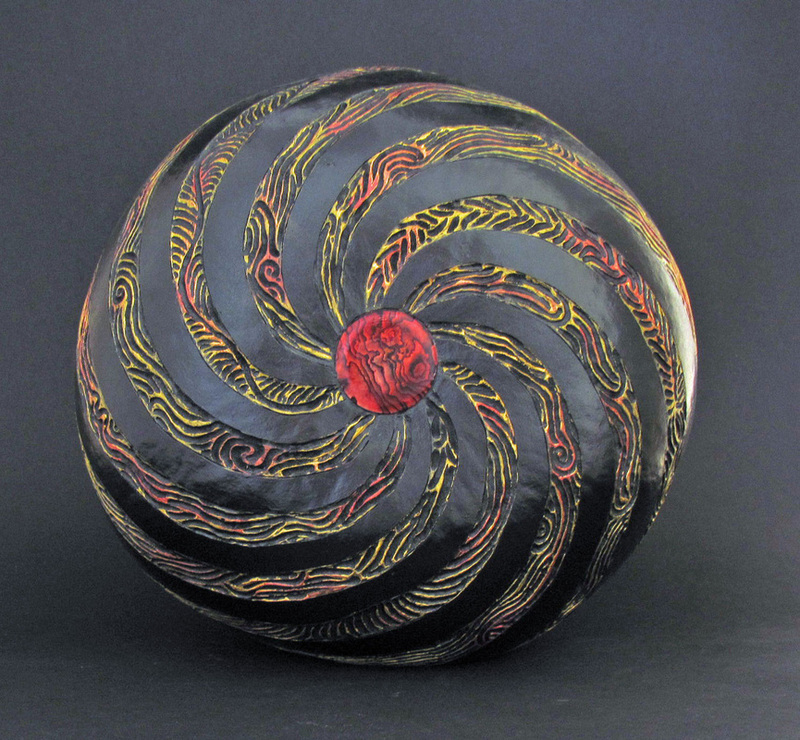 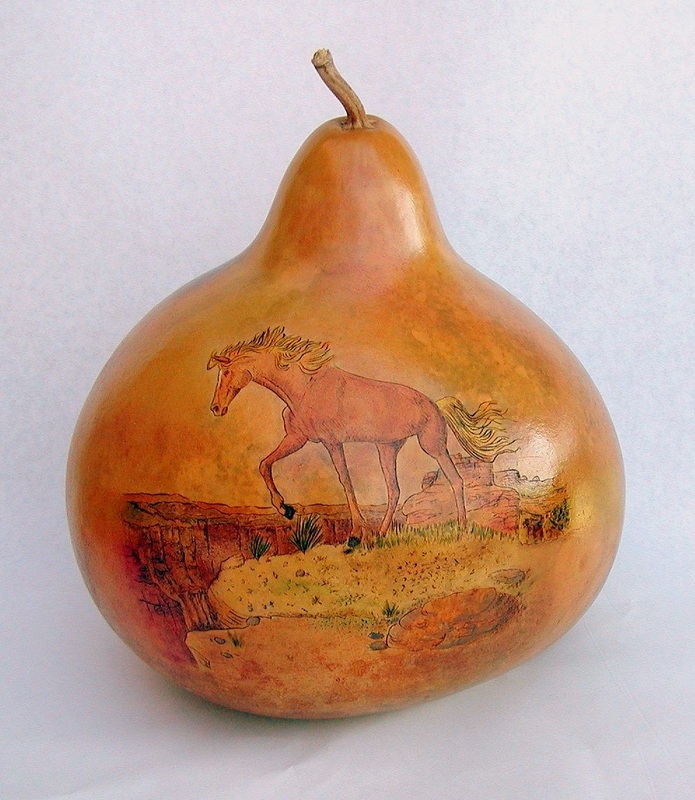 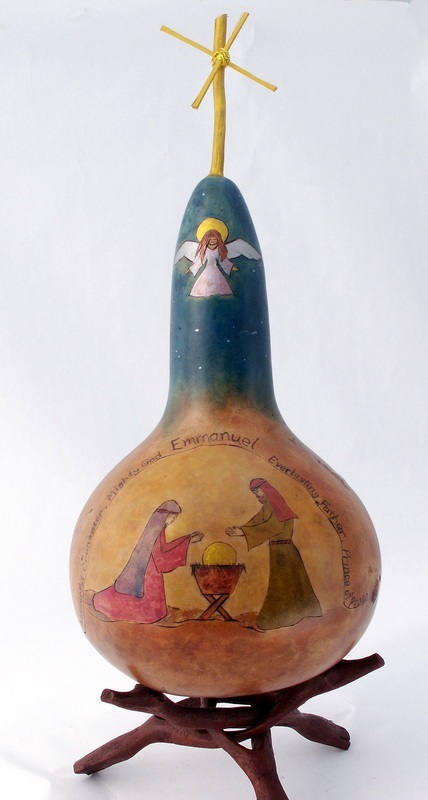 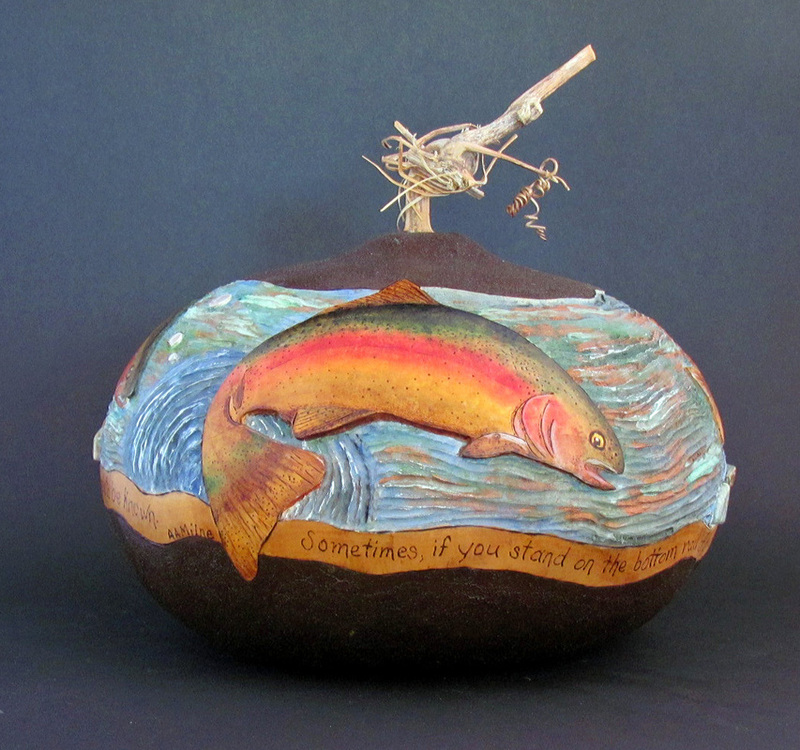 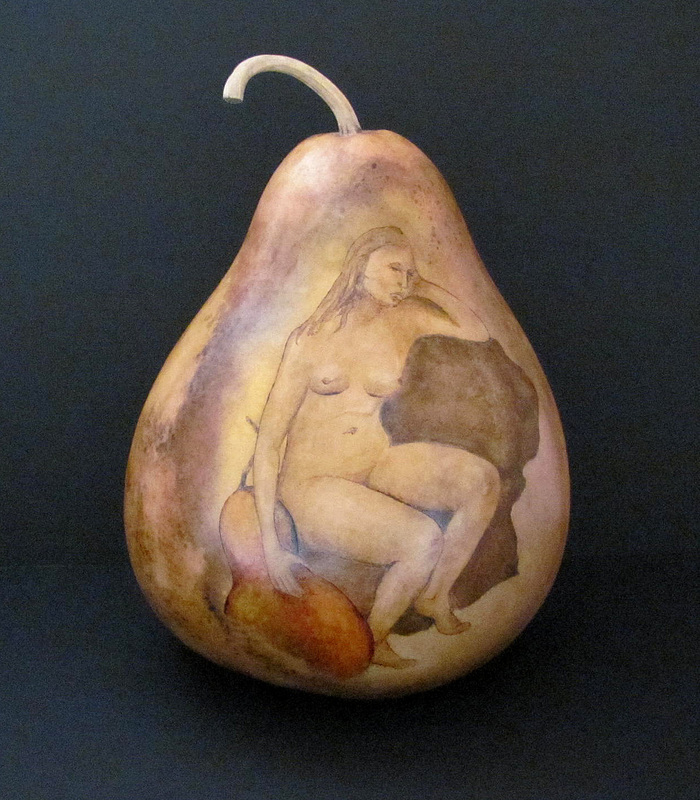 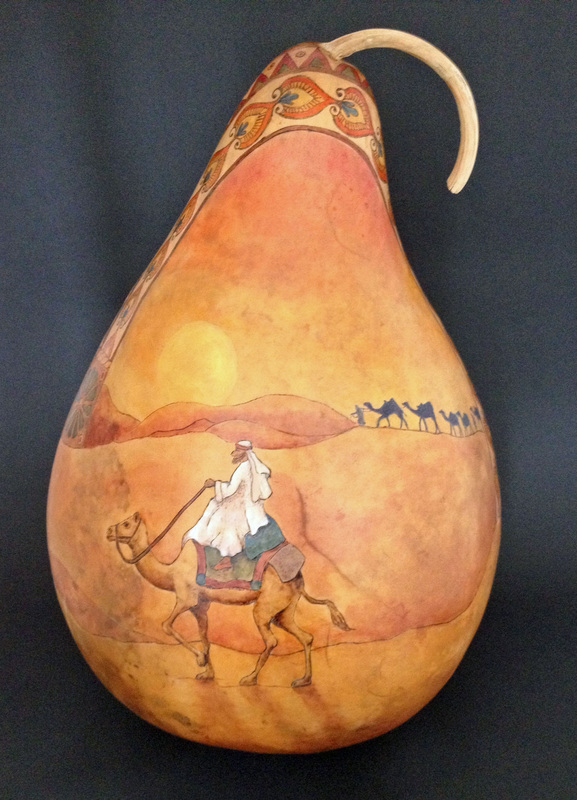 Carved, pyrographed and painted with ink dyes, this gourd stands 12" tall. 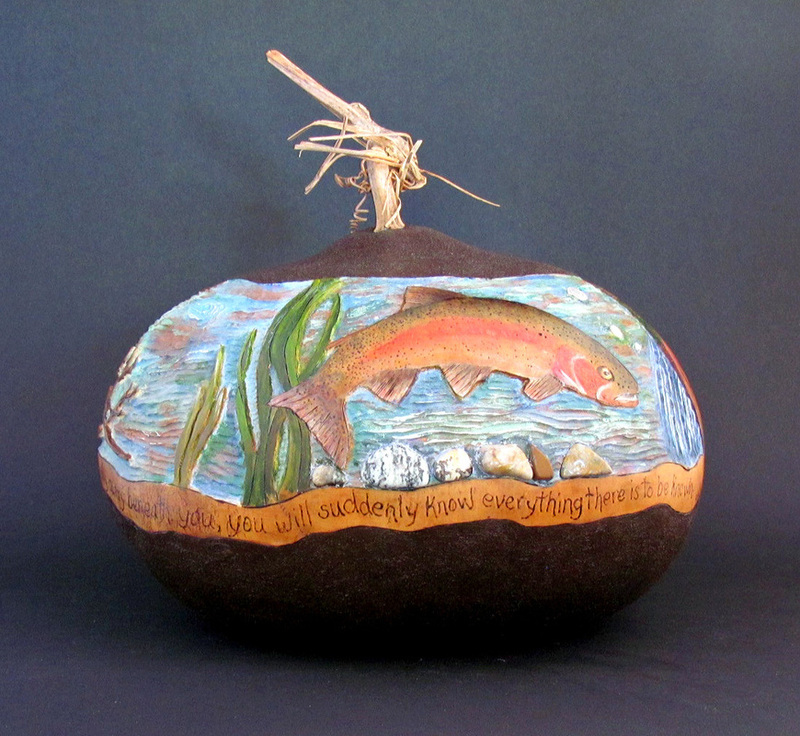 Created for The Arts Colony Corona "Water" Show. 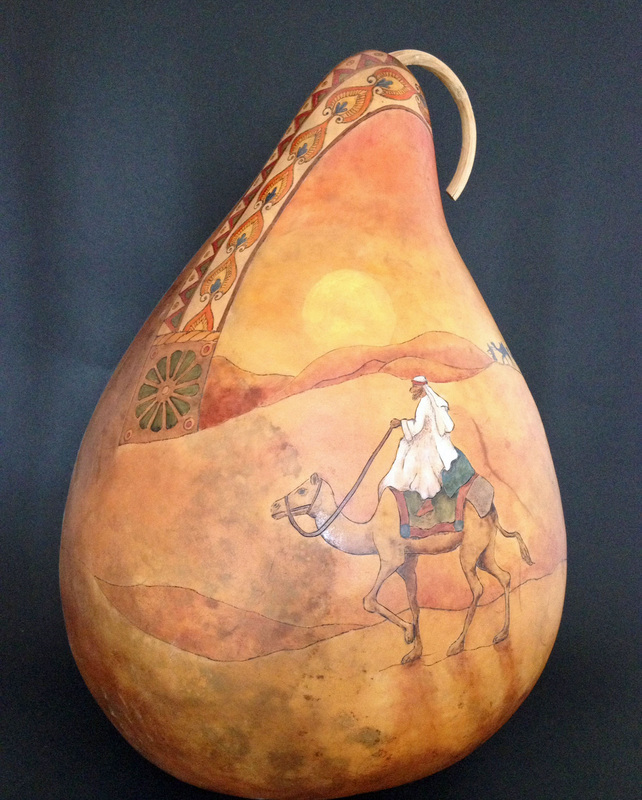 About 14" tall, this gourd has been pyrographed, painted with ink dyes in a pleasing palette of earthtones. 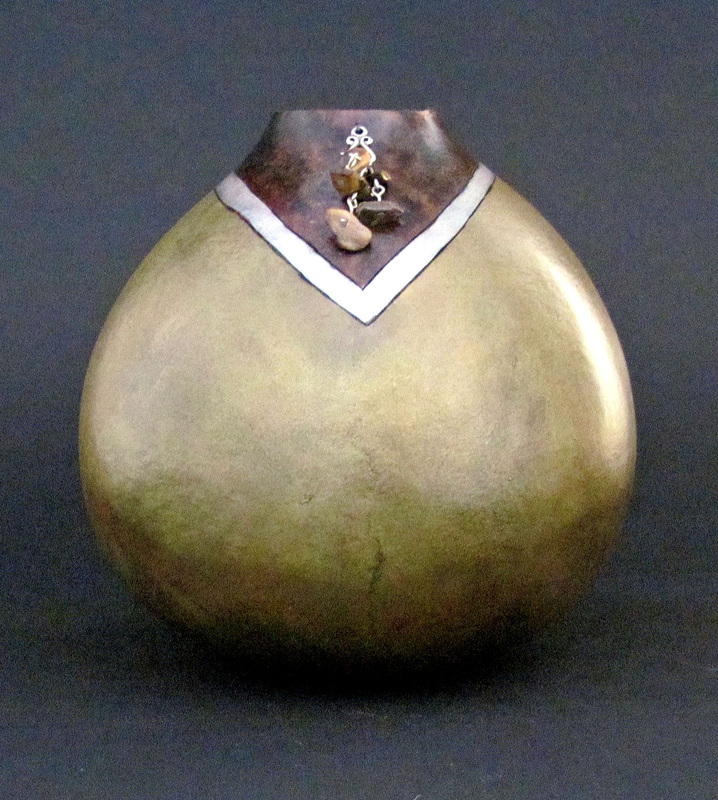 Small areas have been filigree carved and painted with a hint of metallic gold. 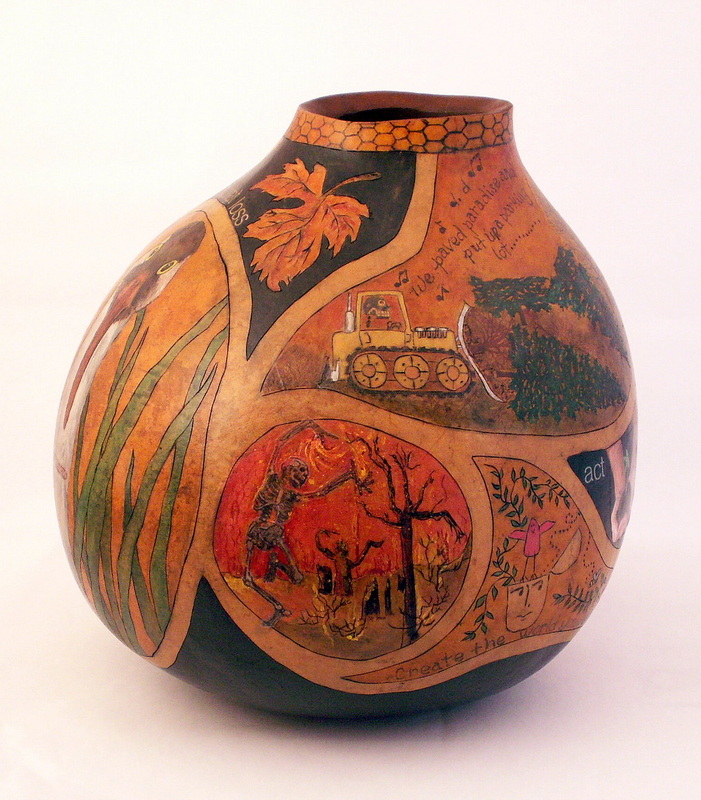 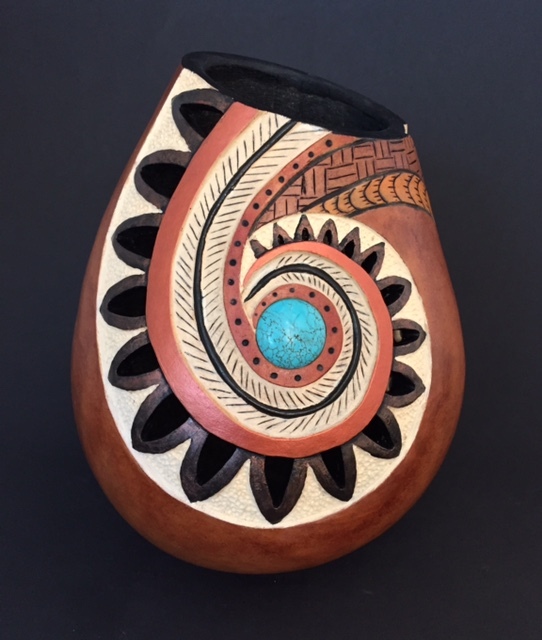 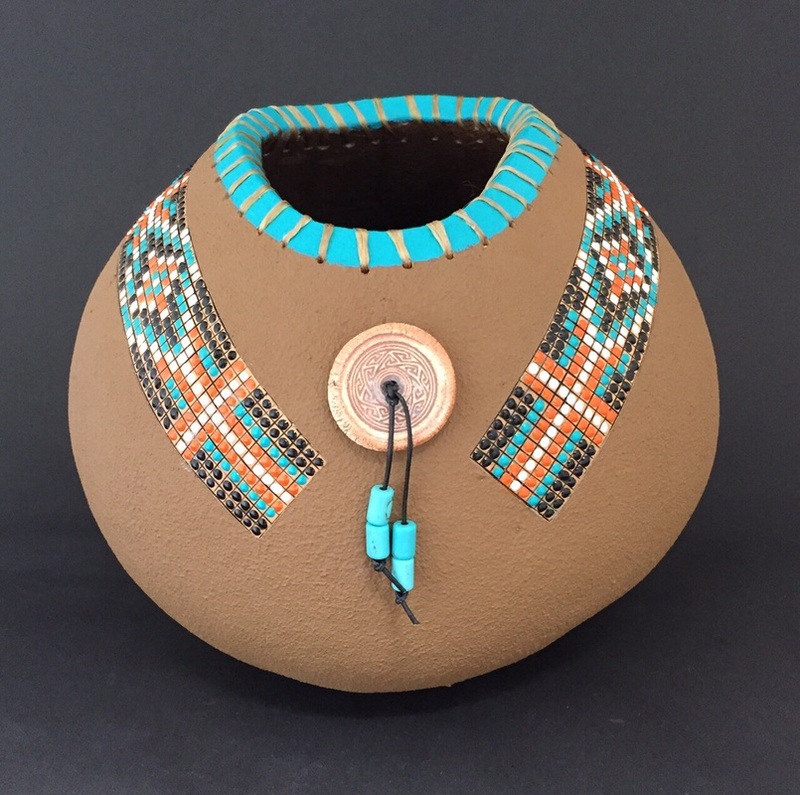 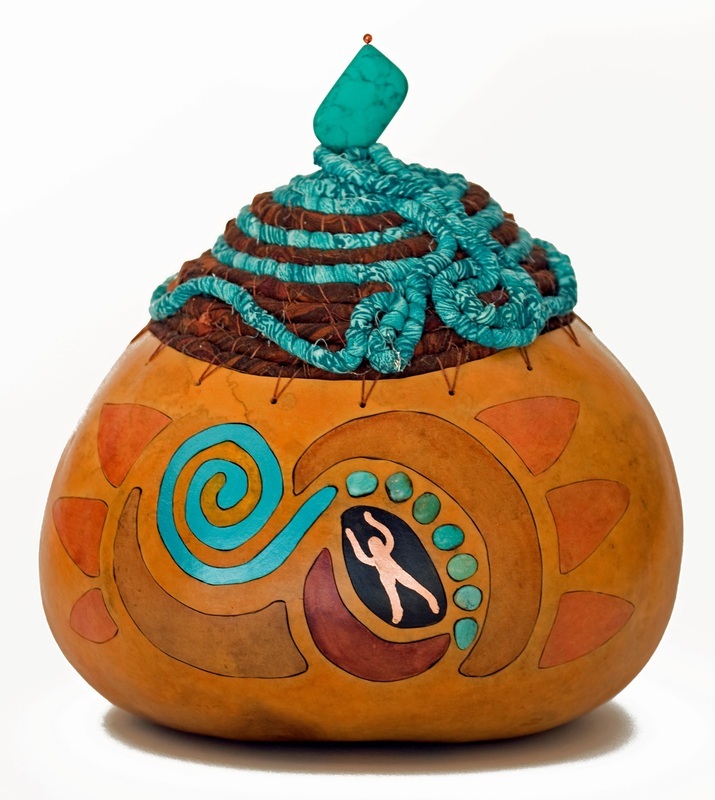 Award winning gourd features woodburned and painted designs, inlaid turquoise and fabric wrapped cording coiled around the top. 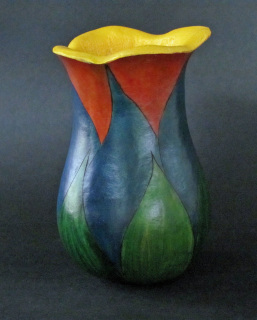 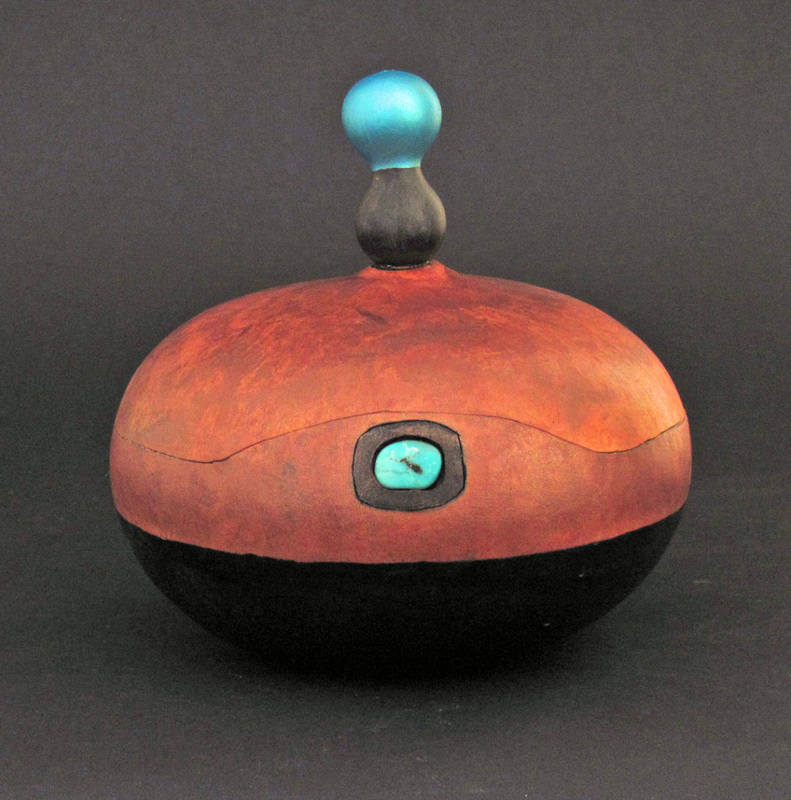 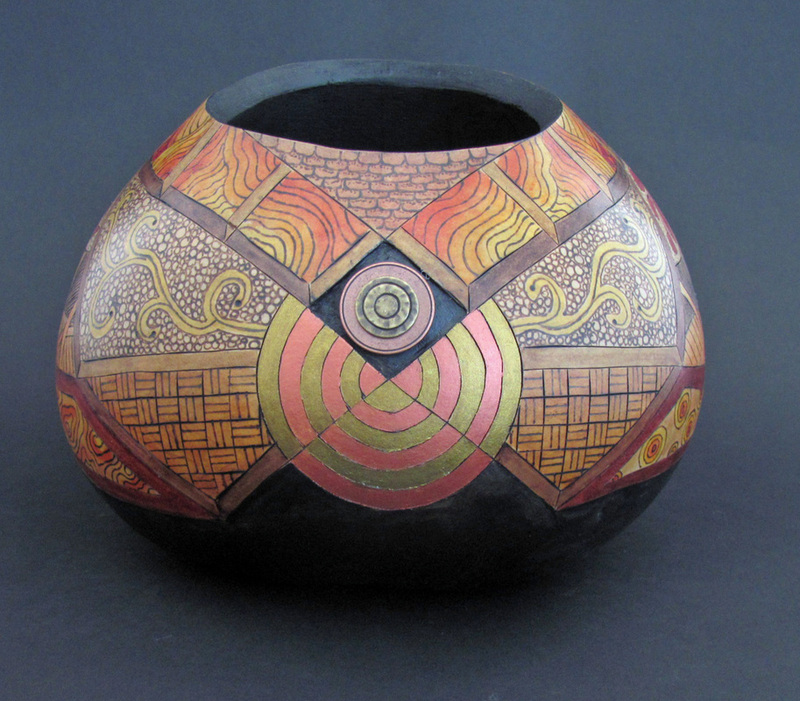 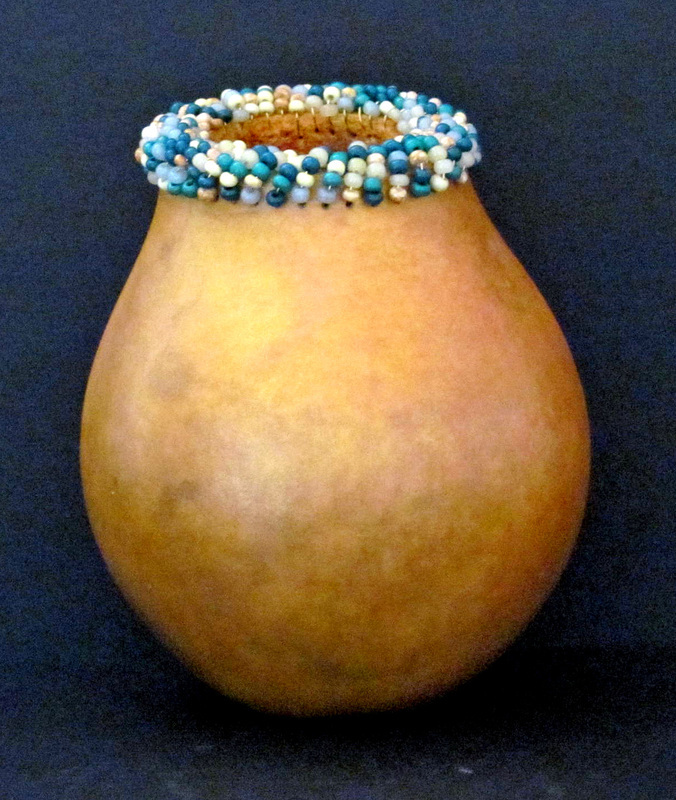 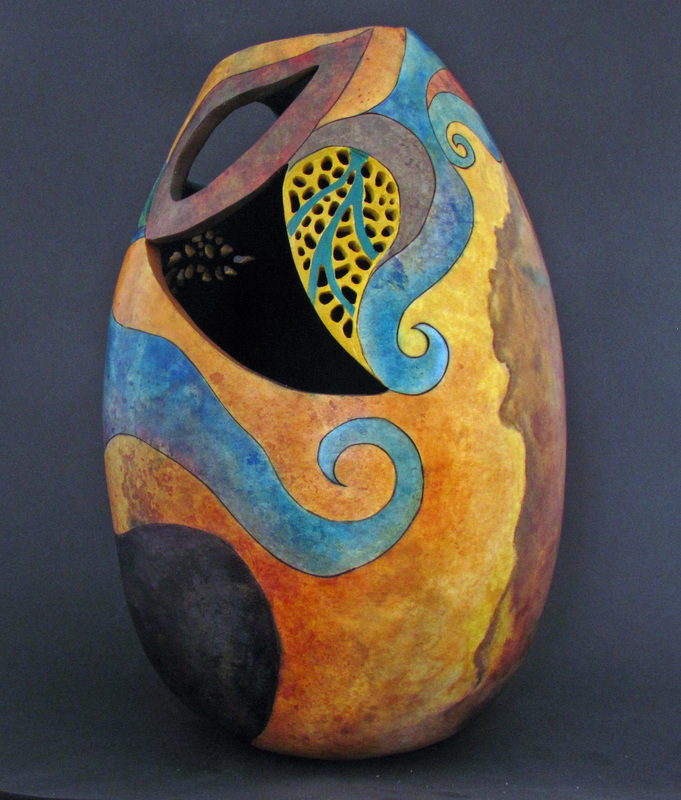 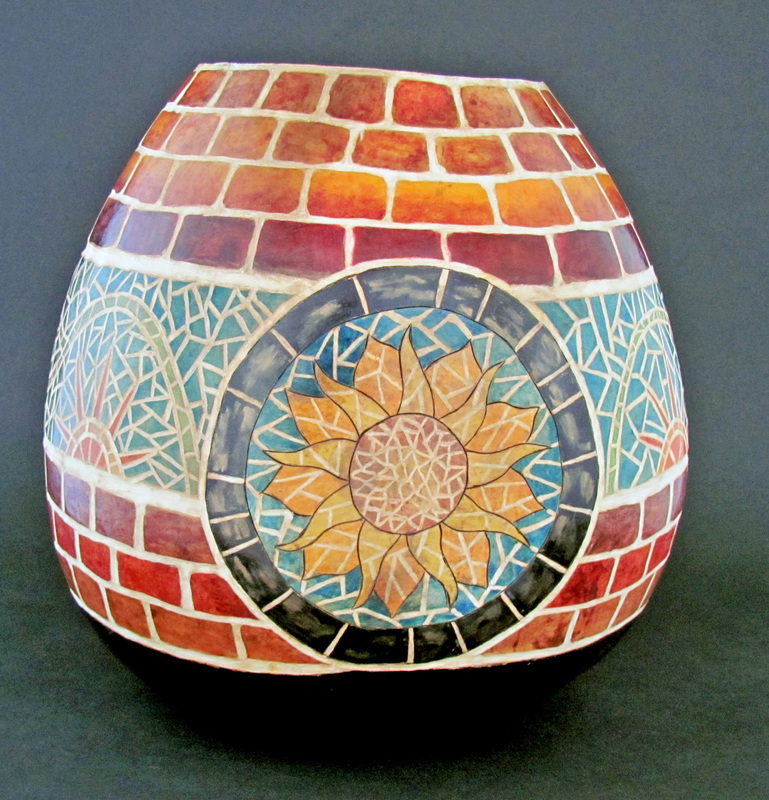 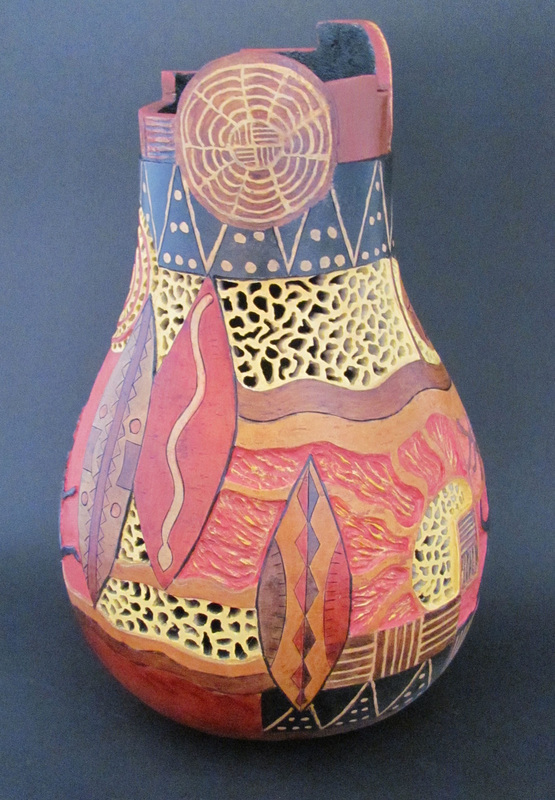 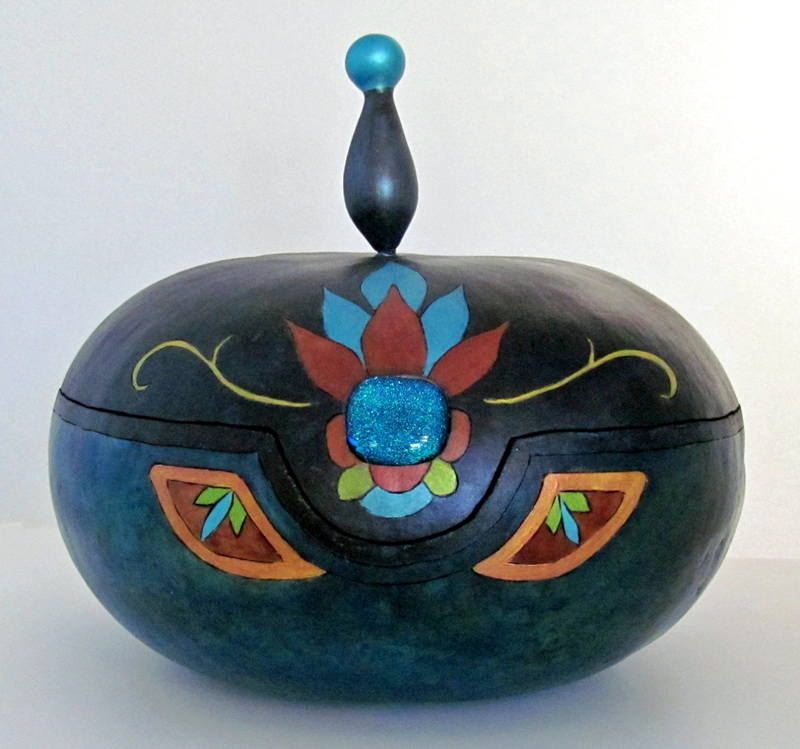 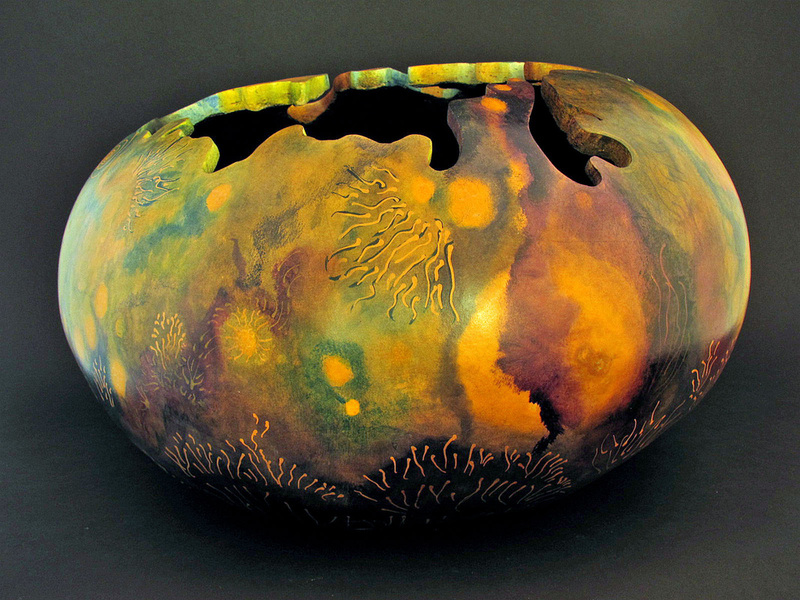 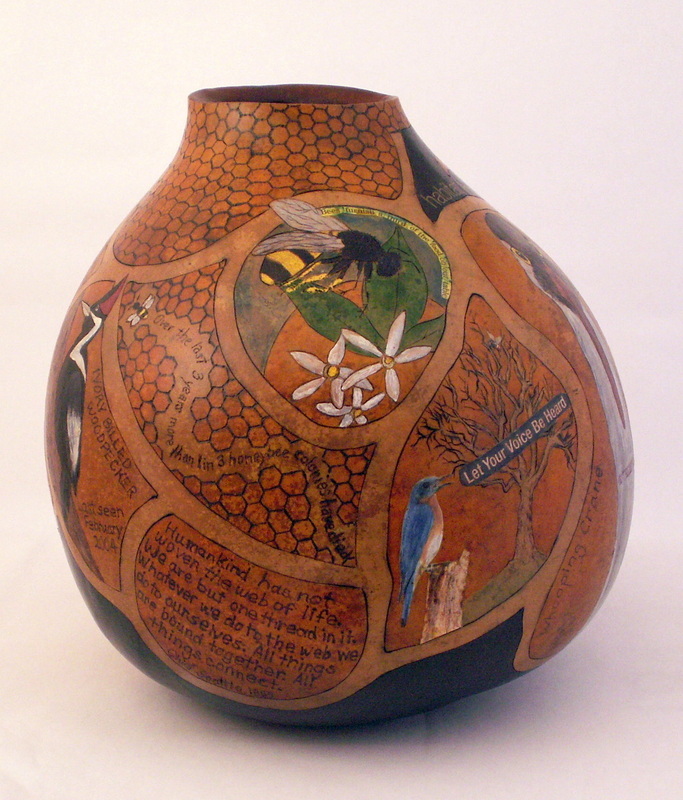 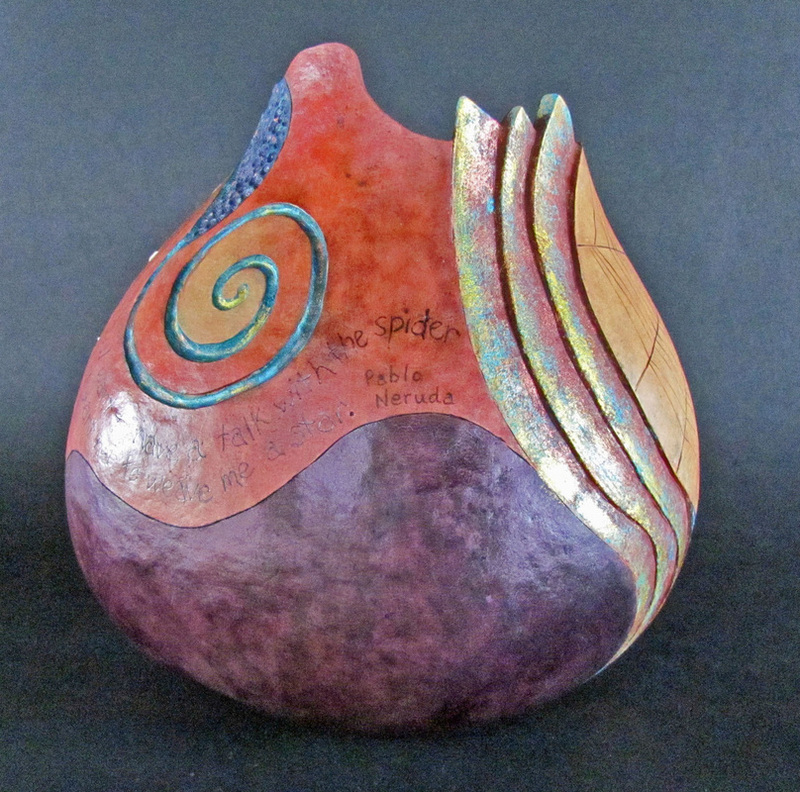 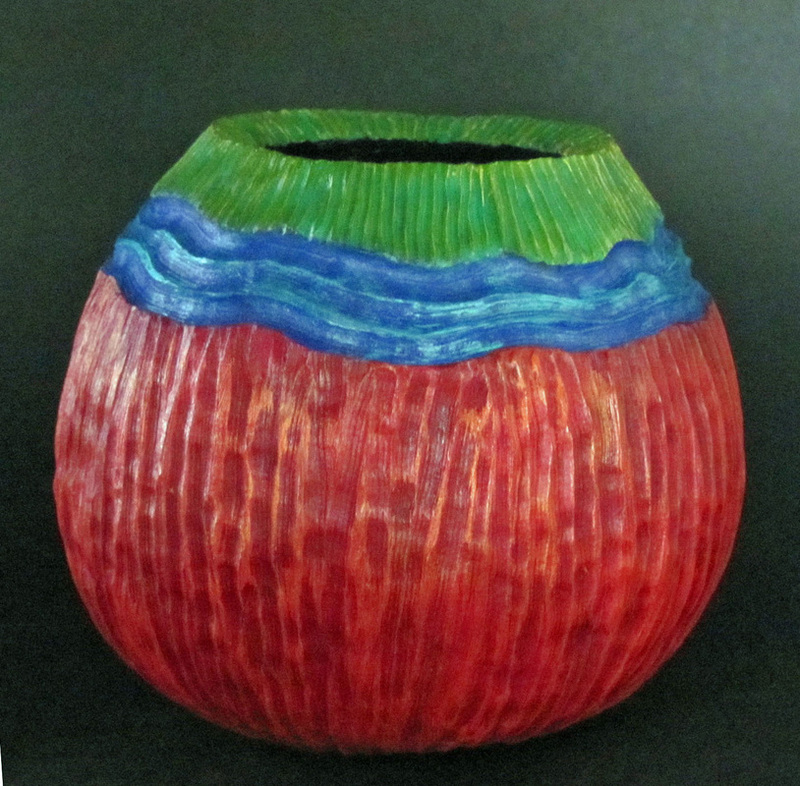 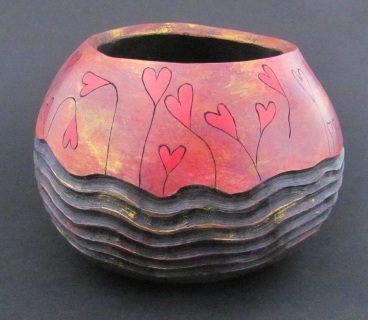 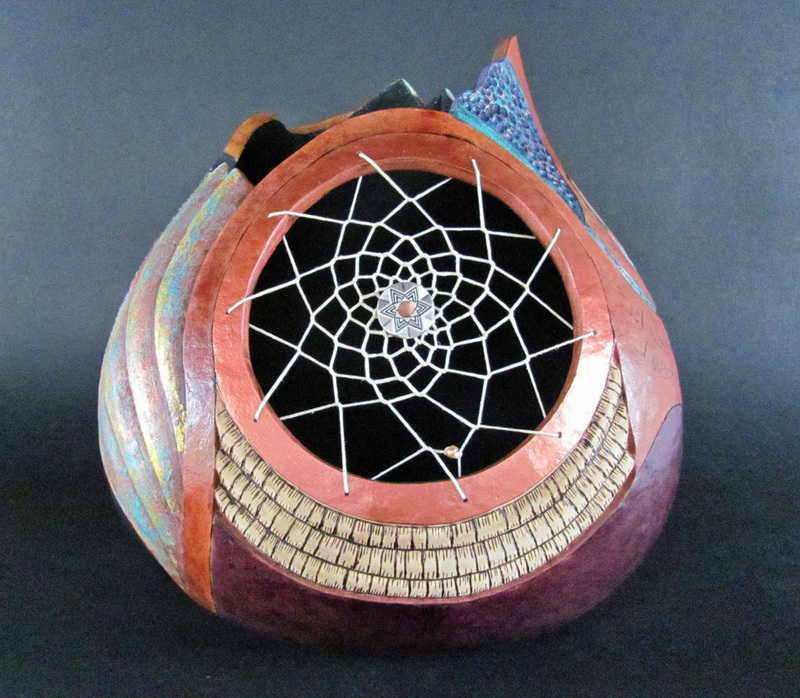 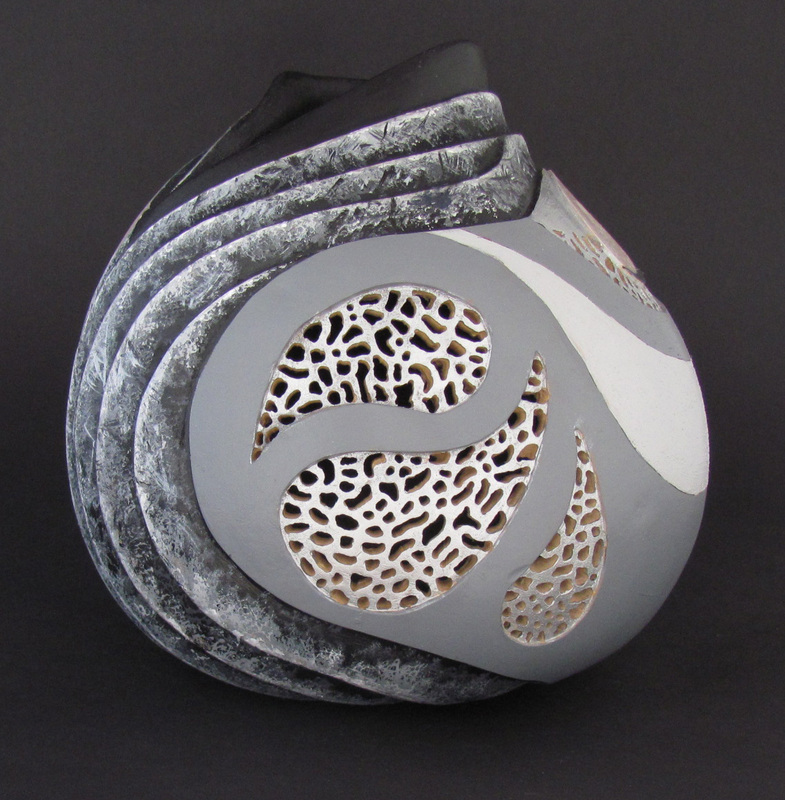 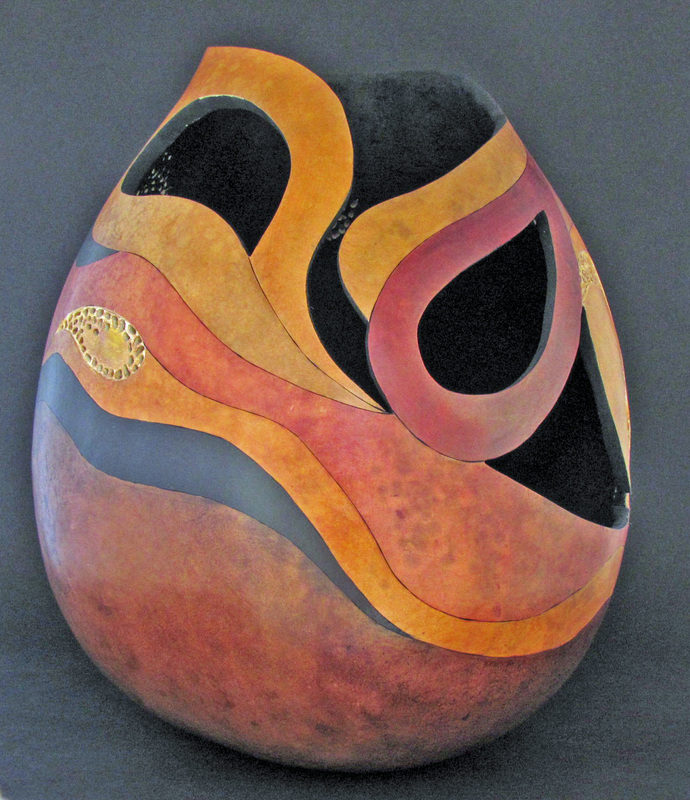 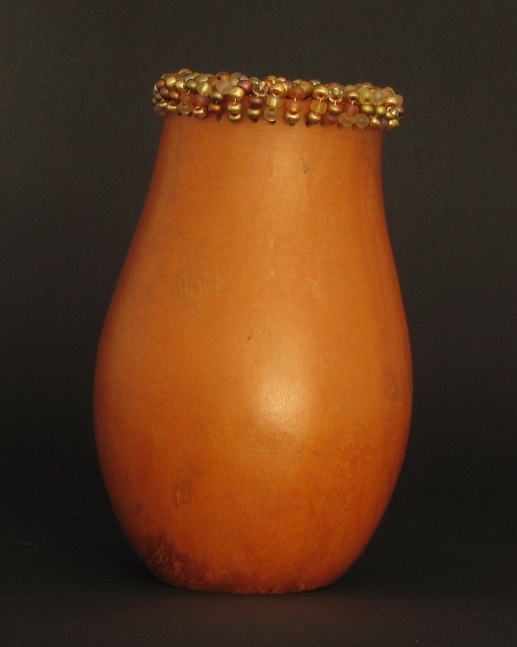 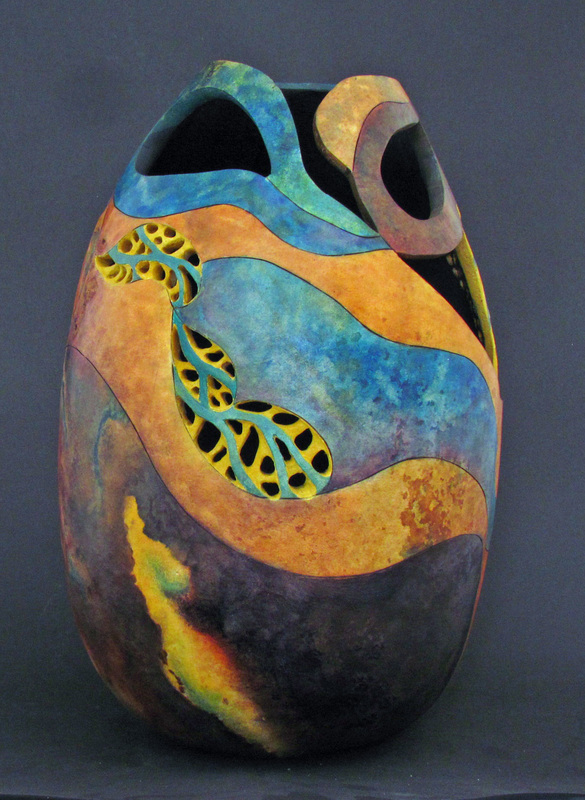 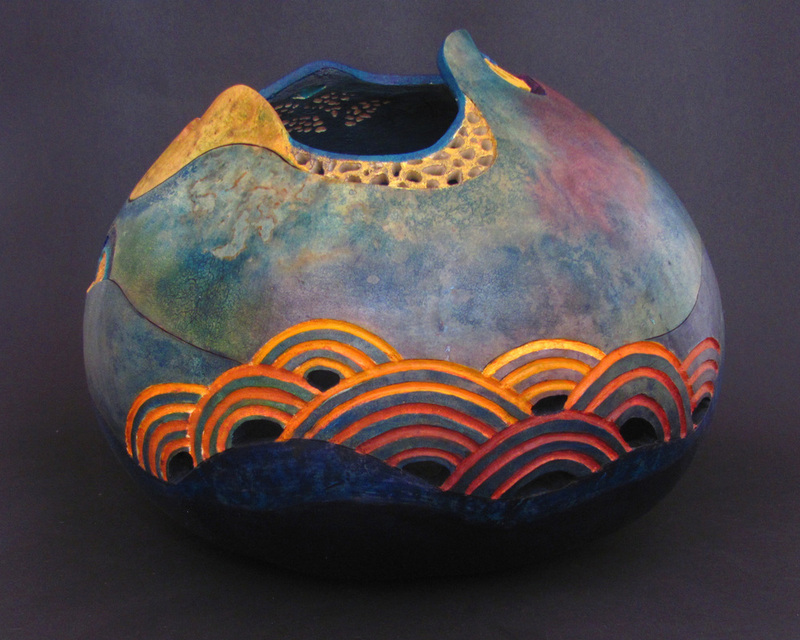 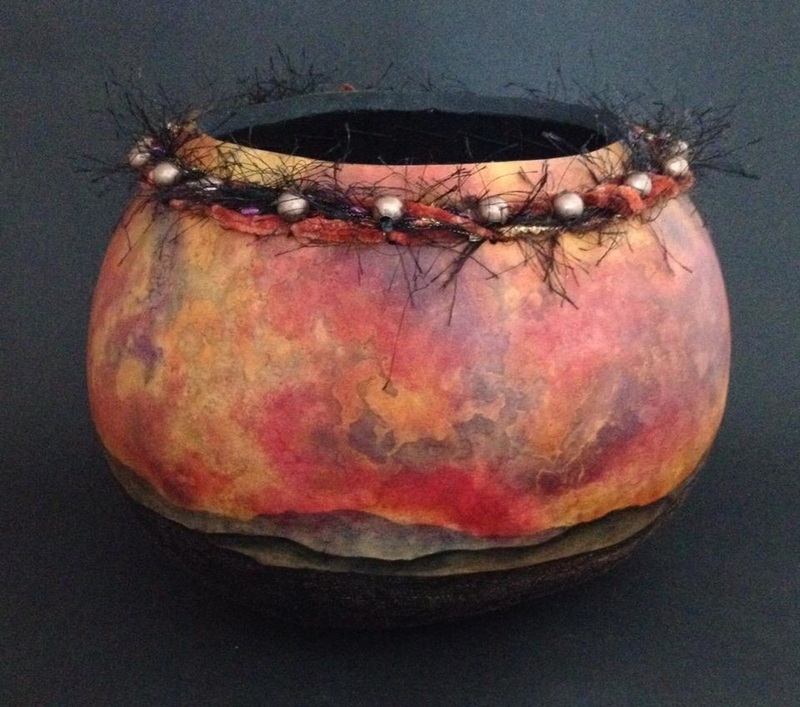 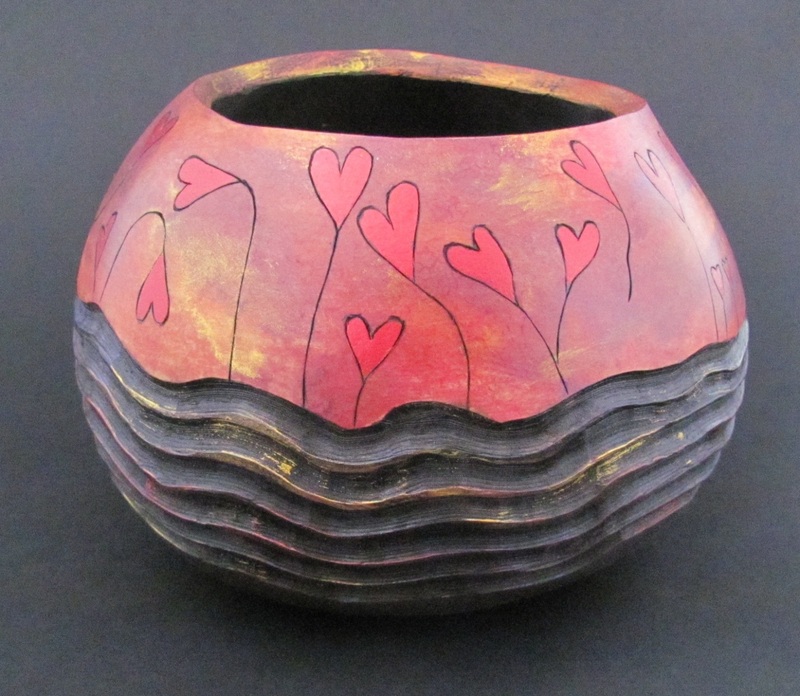 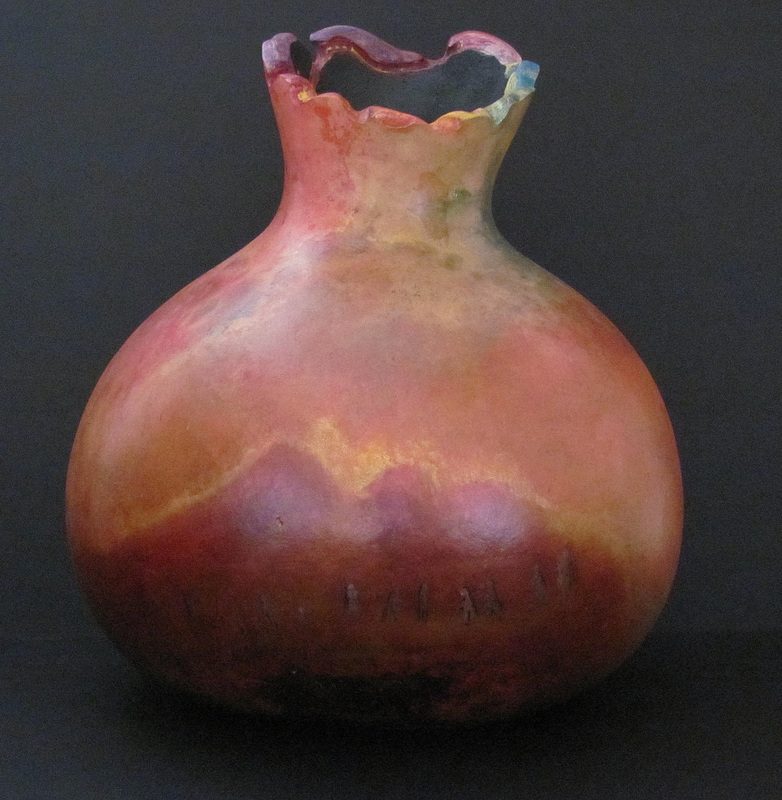 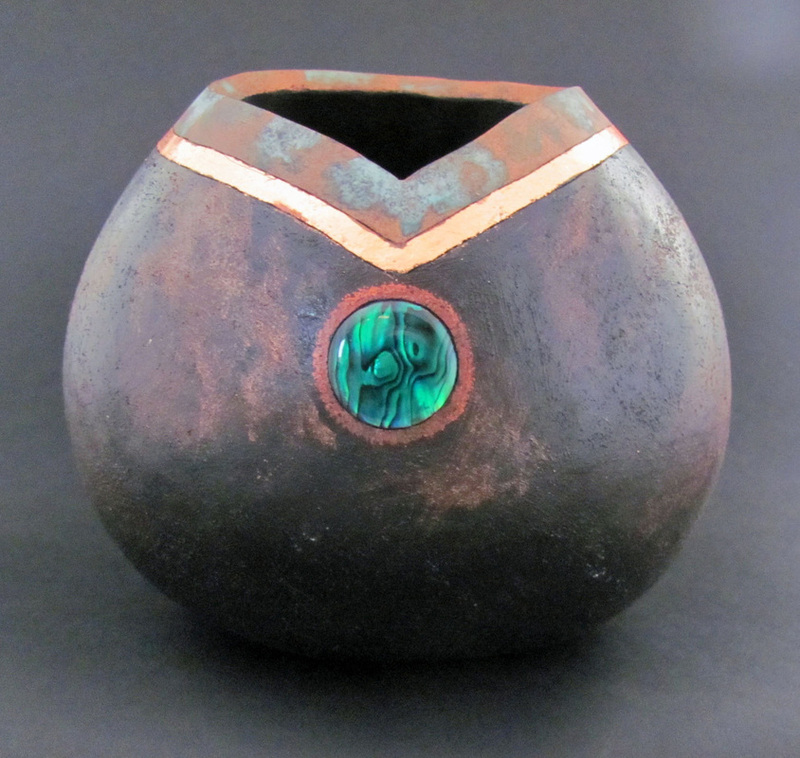 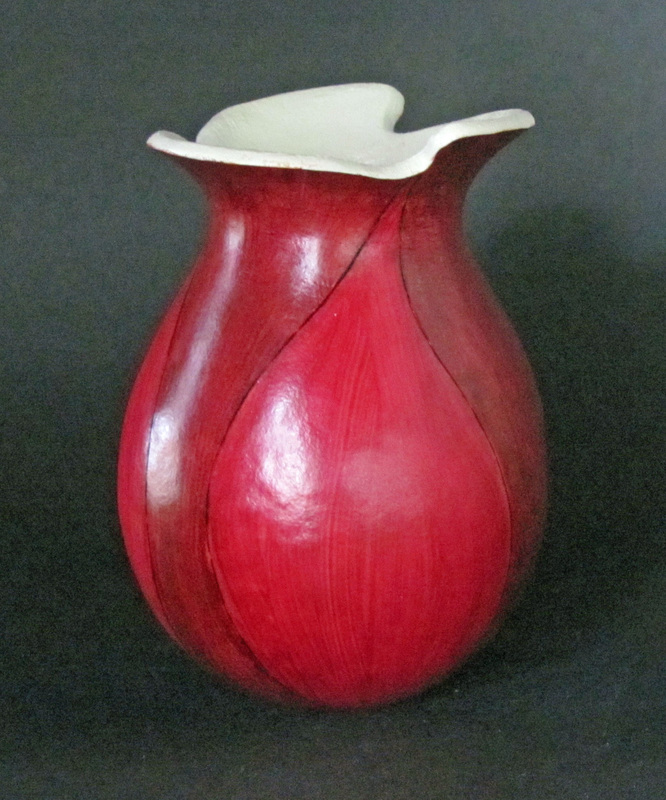 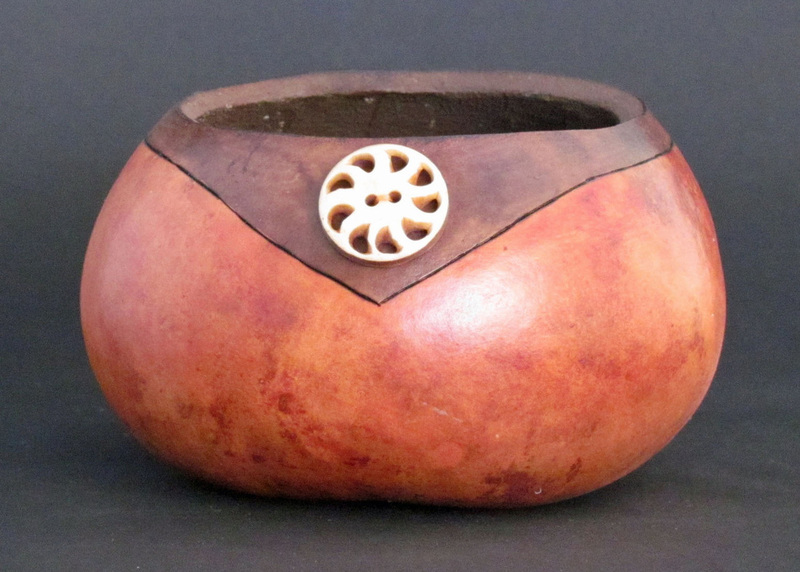 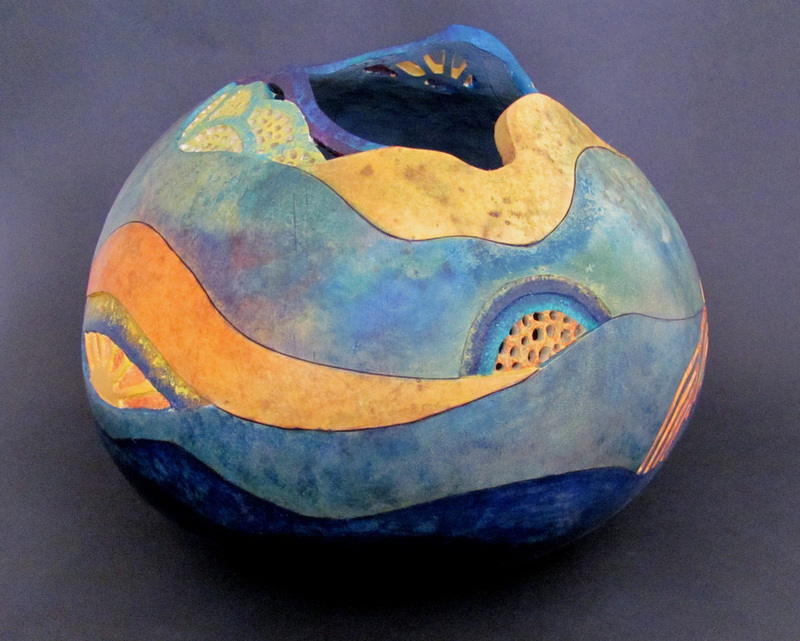 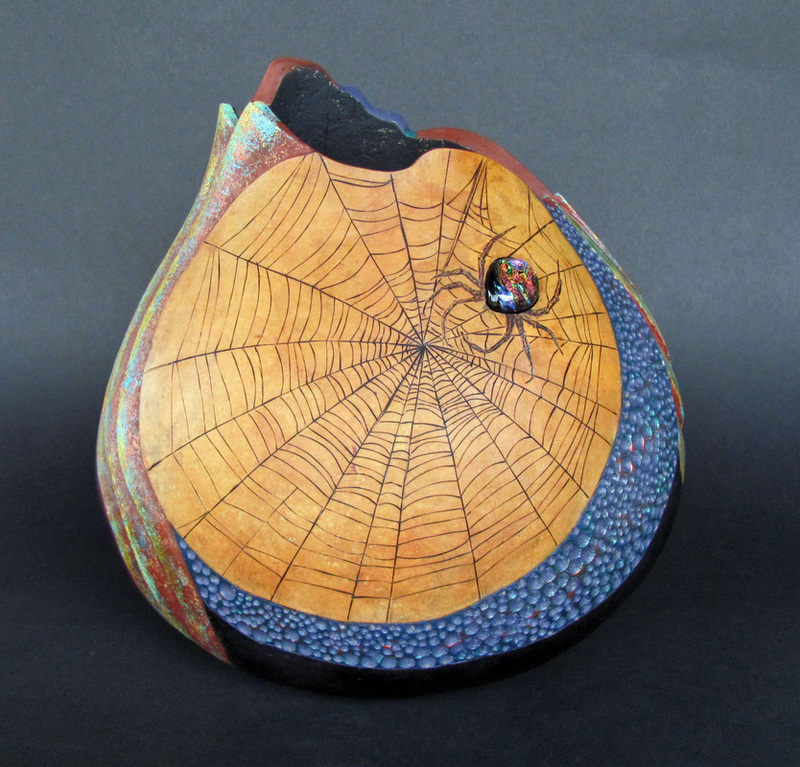 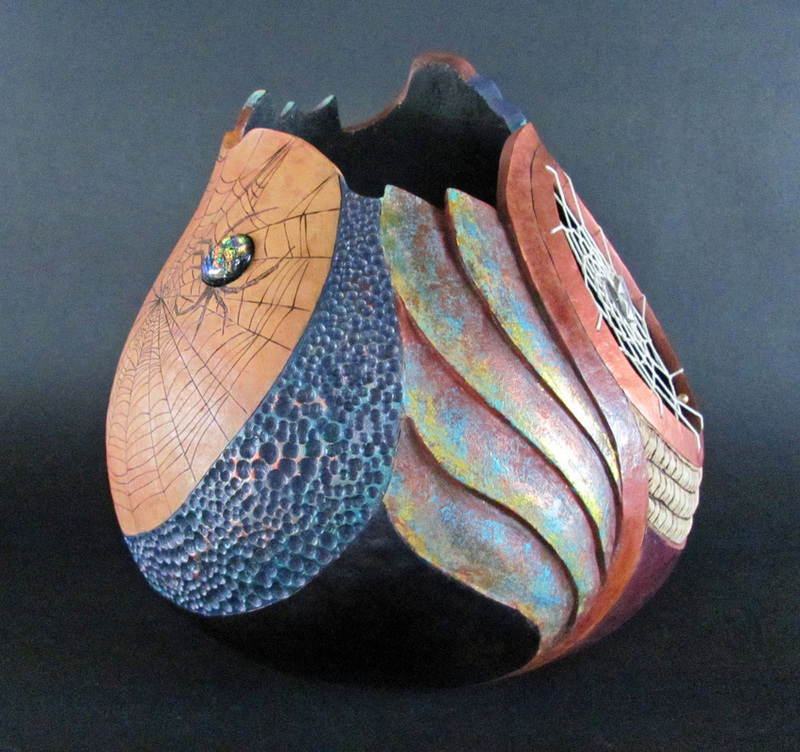 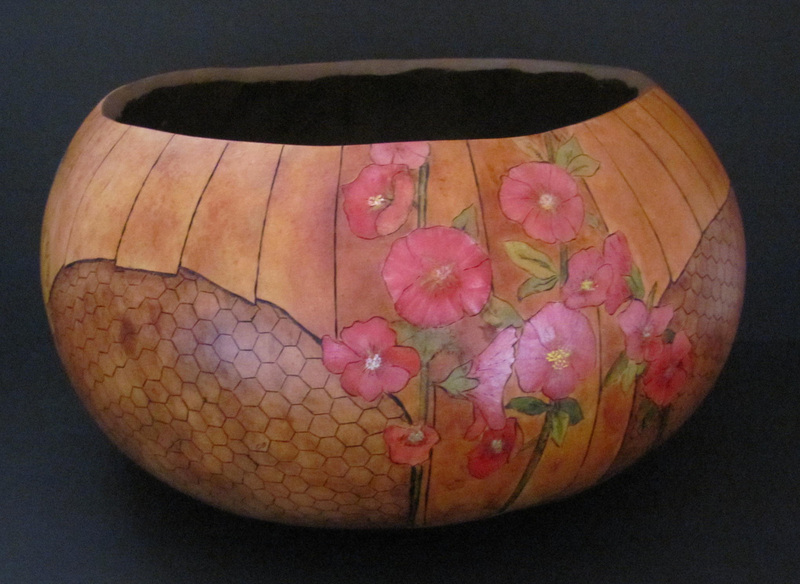 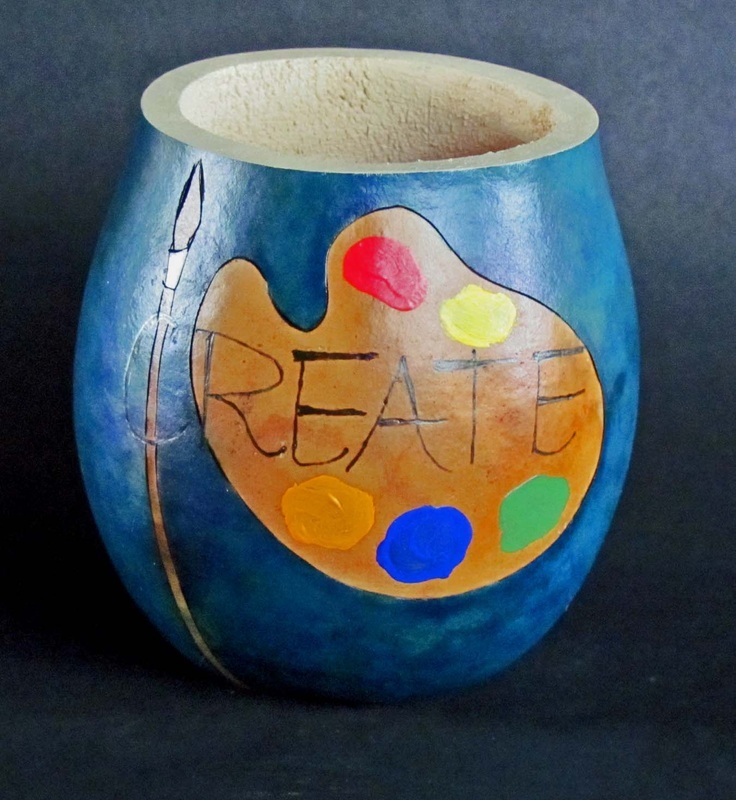 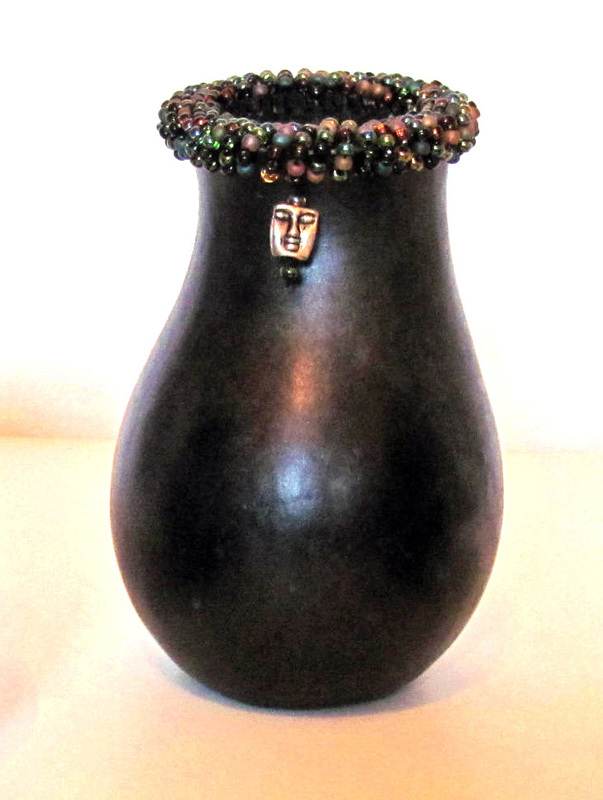 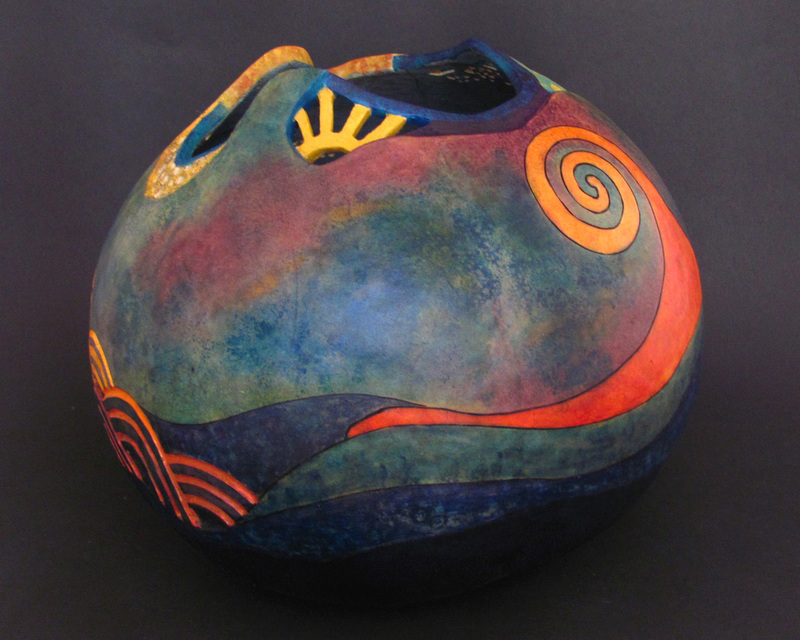 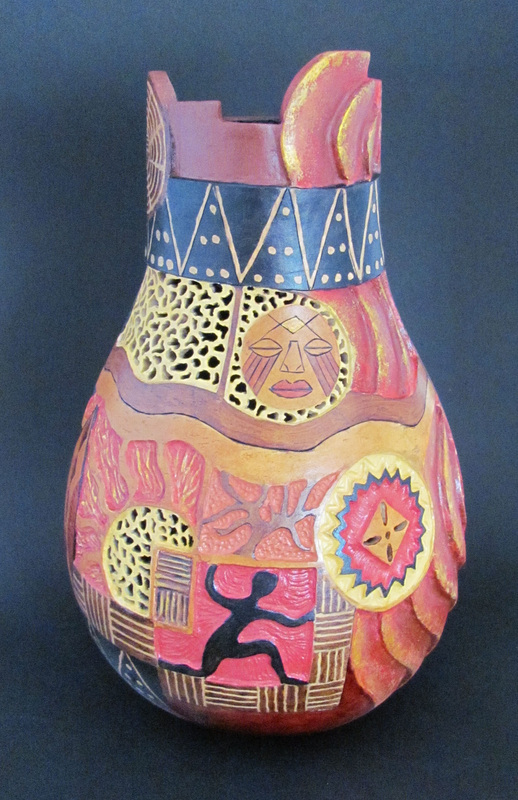 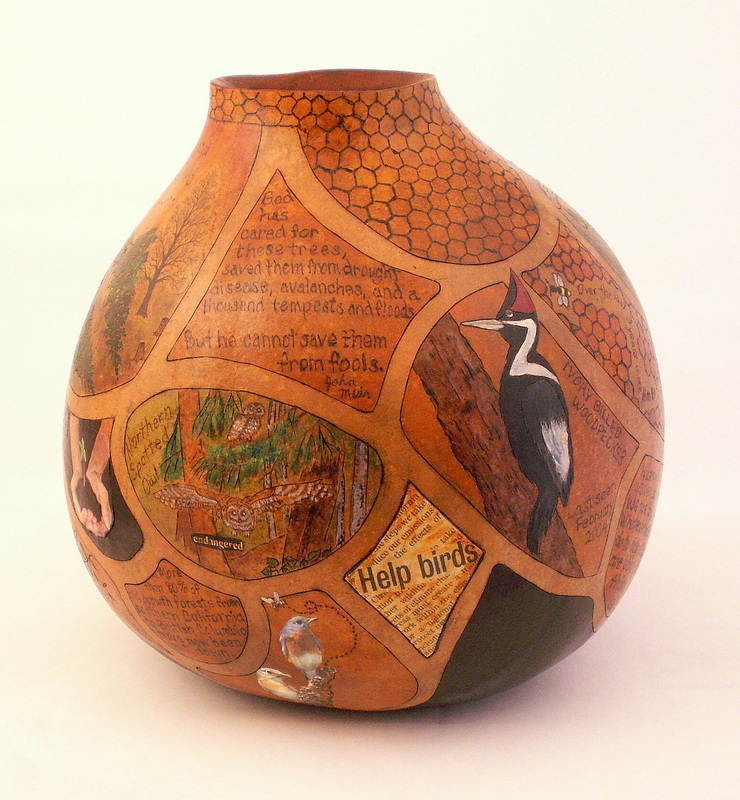 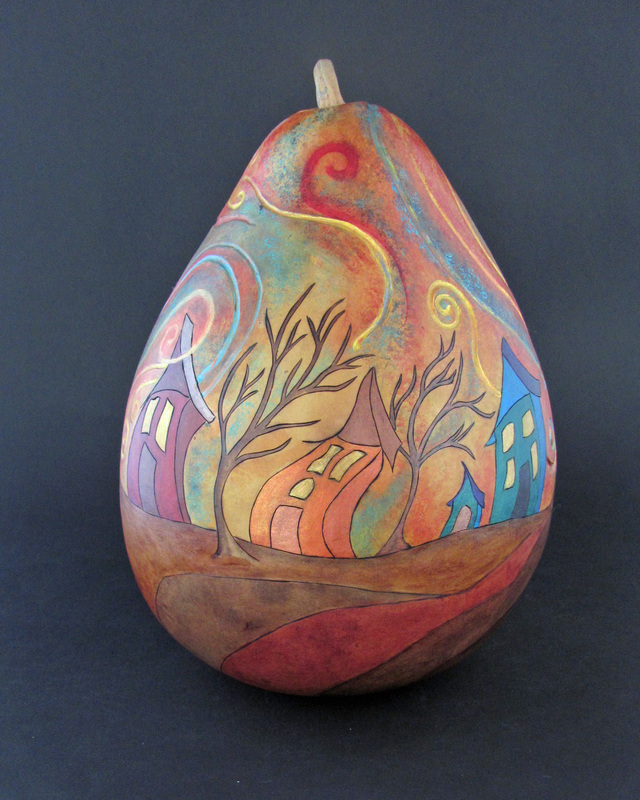 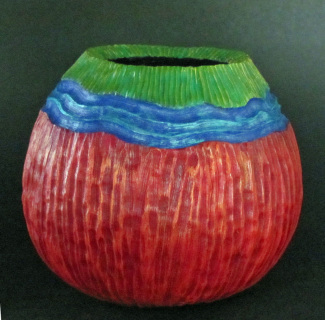 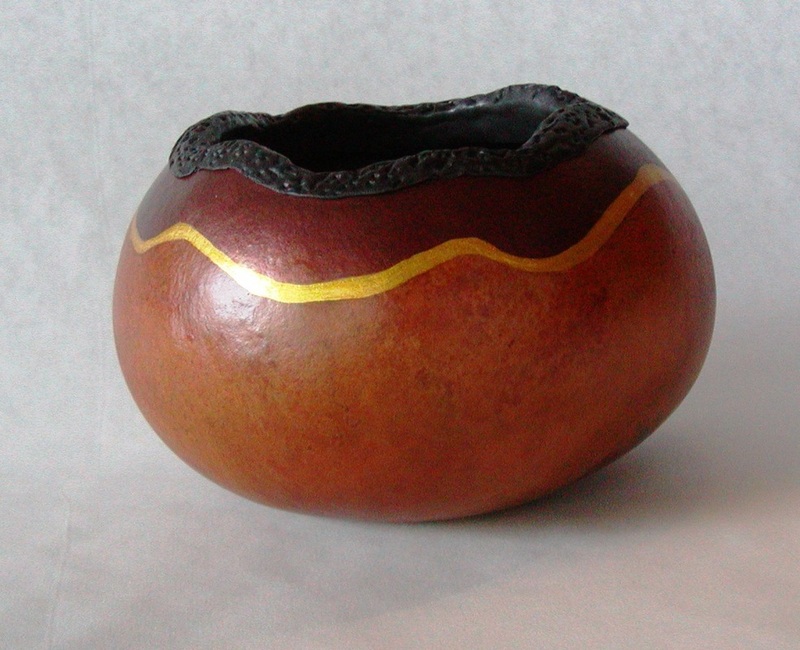 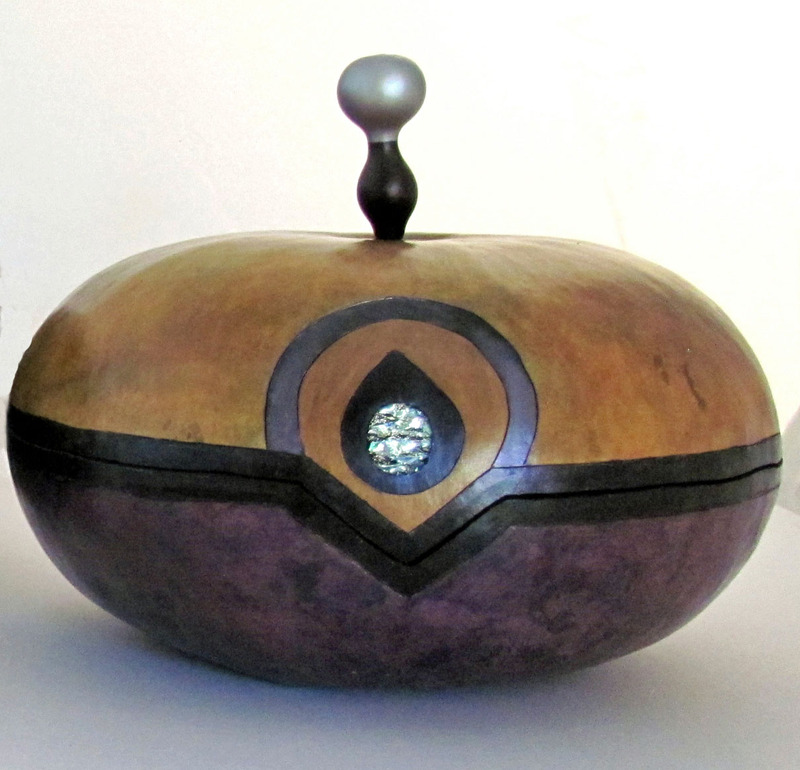 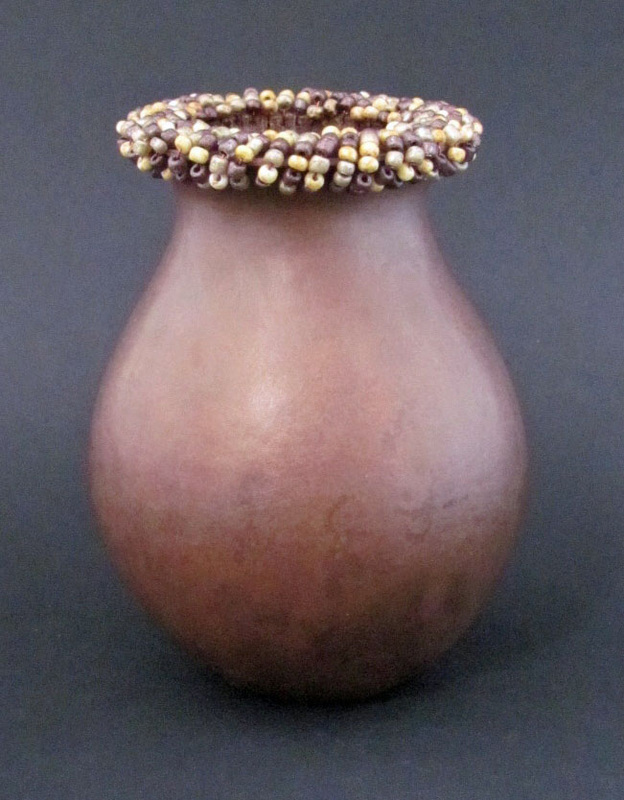 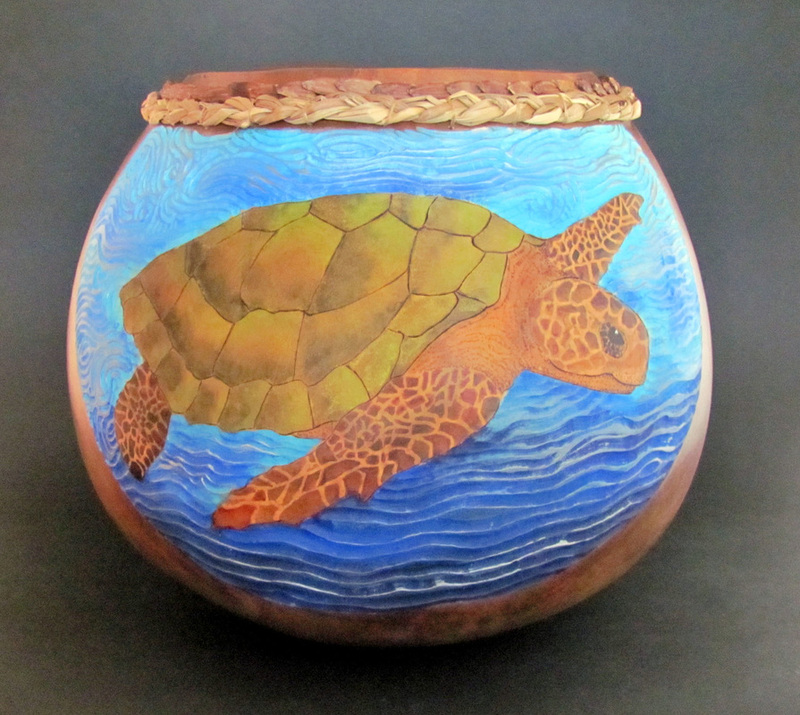 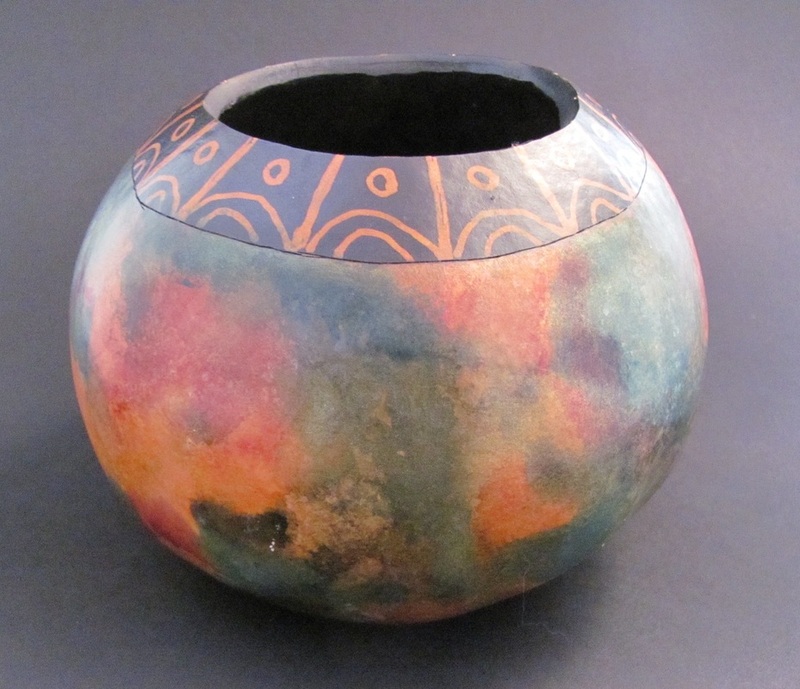 This gourd won an award for the beautiful colors washed and blended throughout the design. 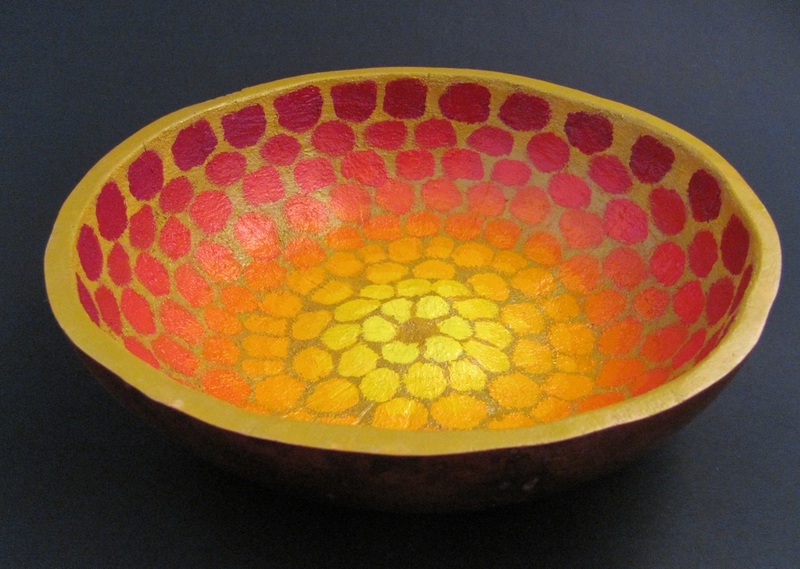 Carved top painted in bright metallic inks. 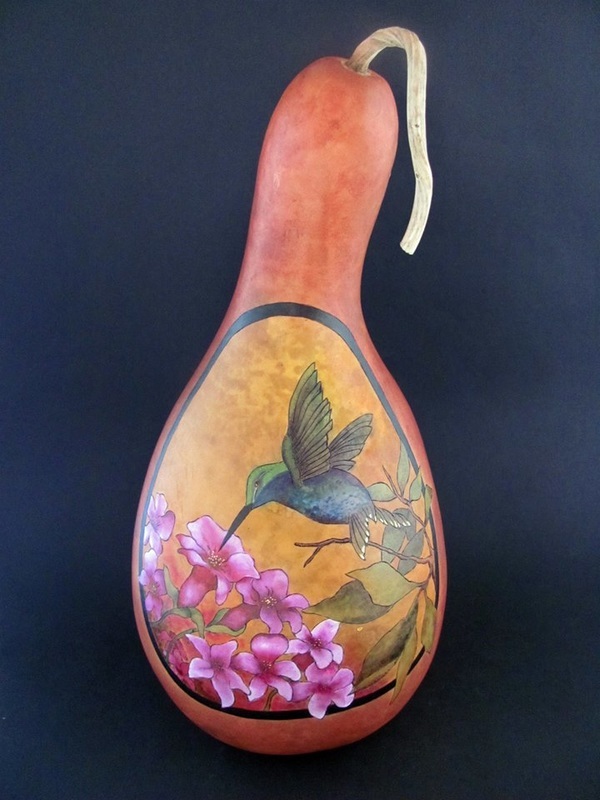 This beautiful gourd is 16" tall, pyrographed and painted with a blue and green hummingbird enjoying a sweet snack in the garden. 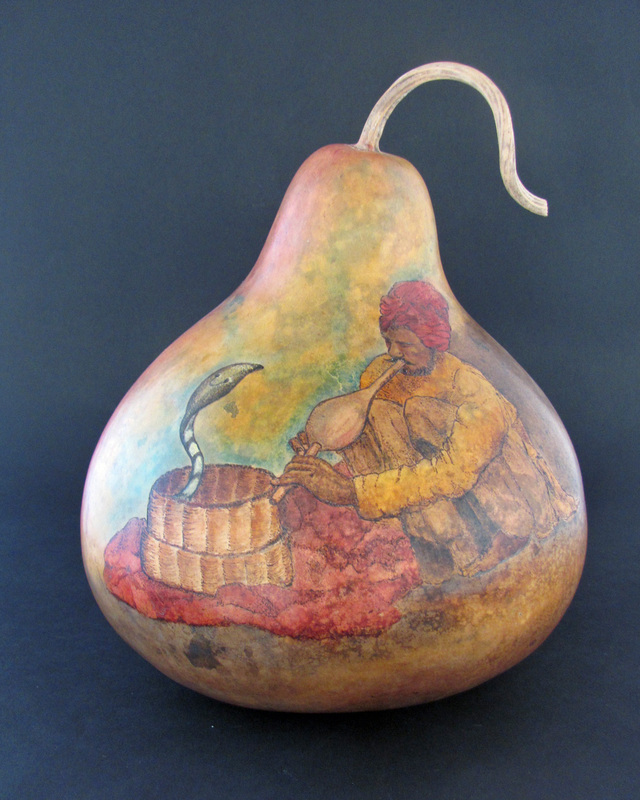 Intricate carving, hand painting and an inlaid shell highlight this unique art gourd. 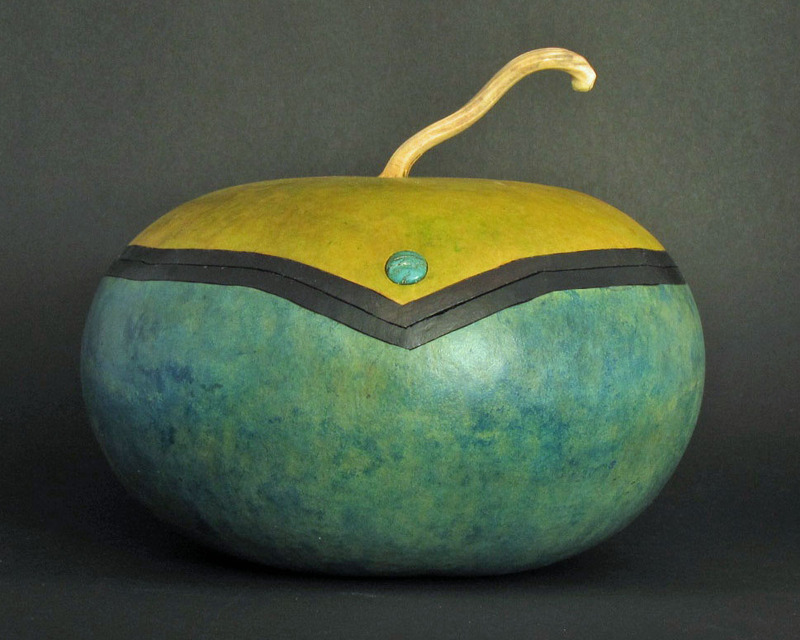 10" diameter canteen gourd. 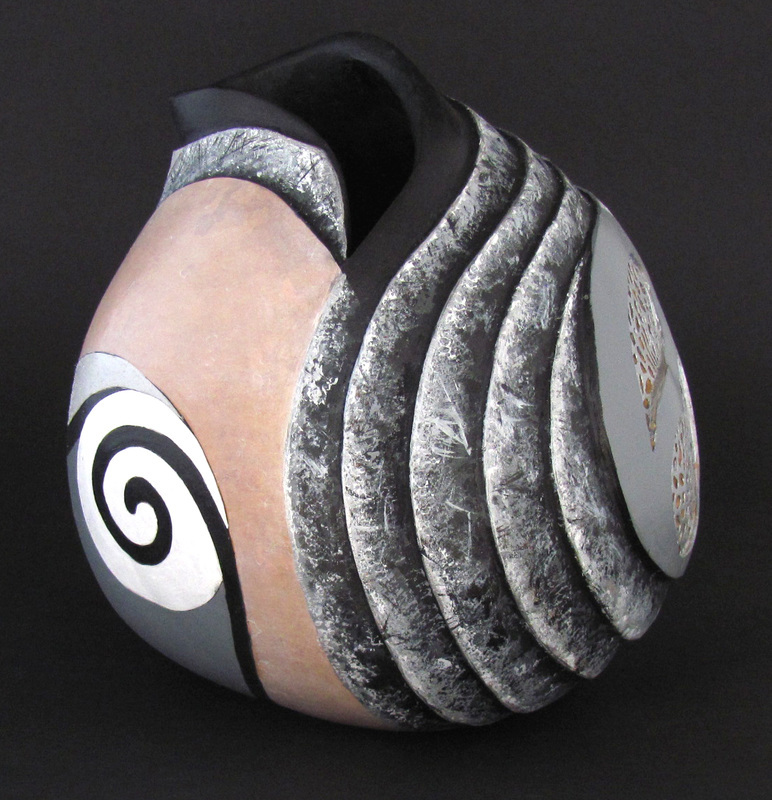 The back has a black textured finish, similar to raku pottery. 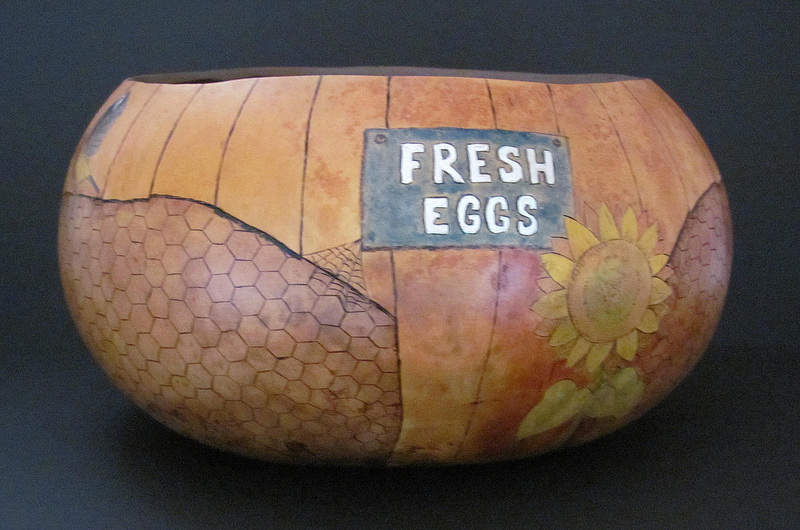 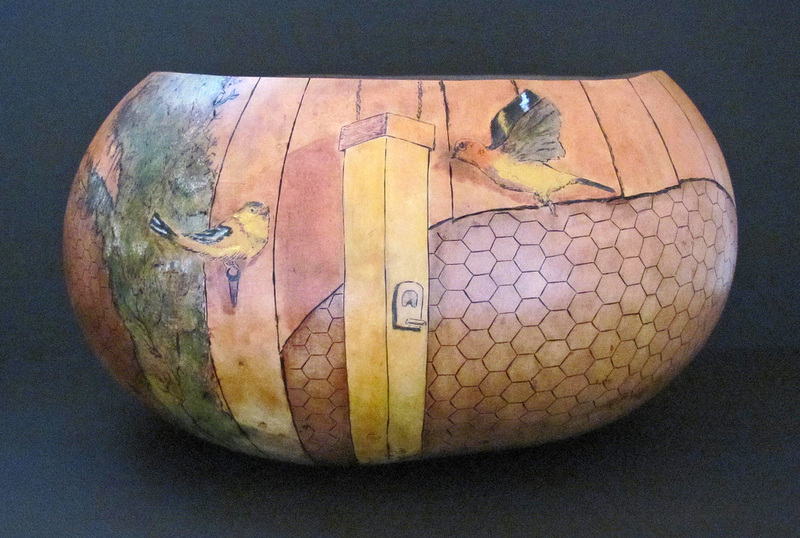 This gourd bowl was inspired by our own backyard chicken coop. 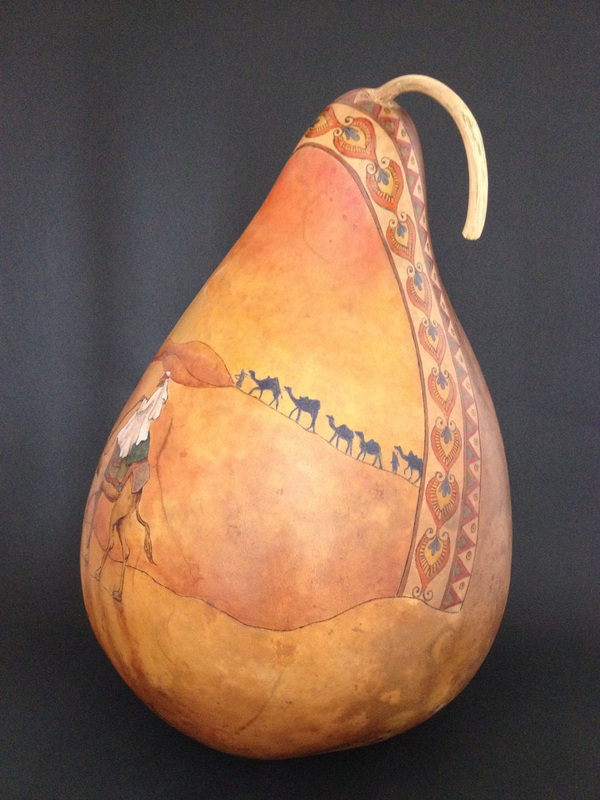 This award winning gourd celebrates Mexican folk art. 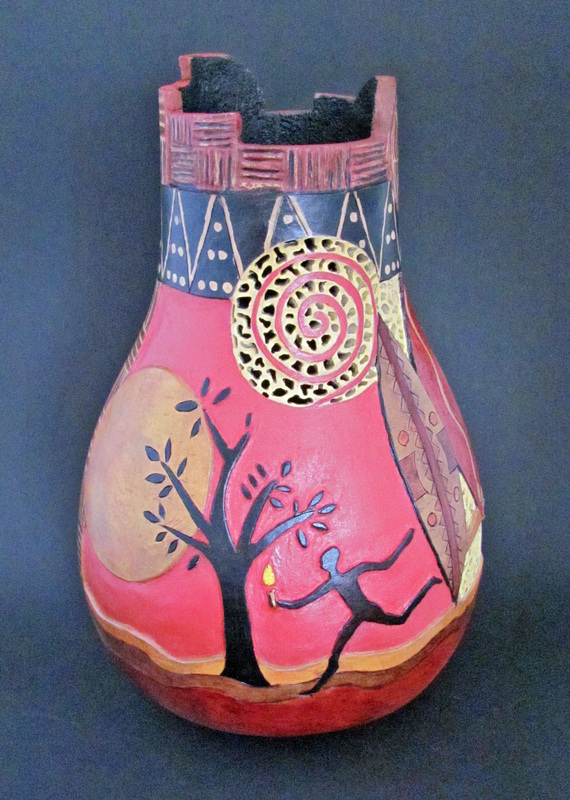 Click on thumbnails below for more views. 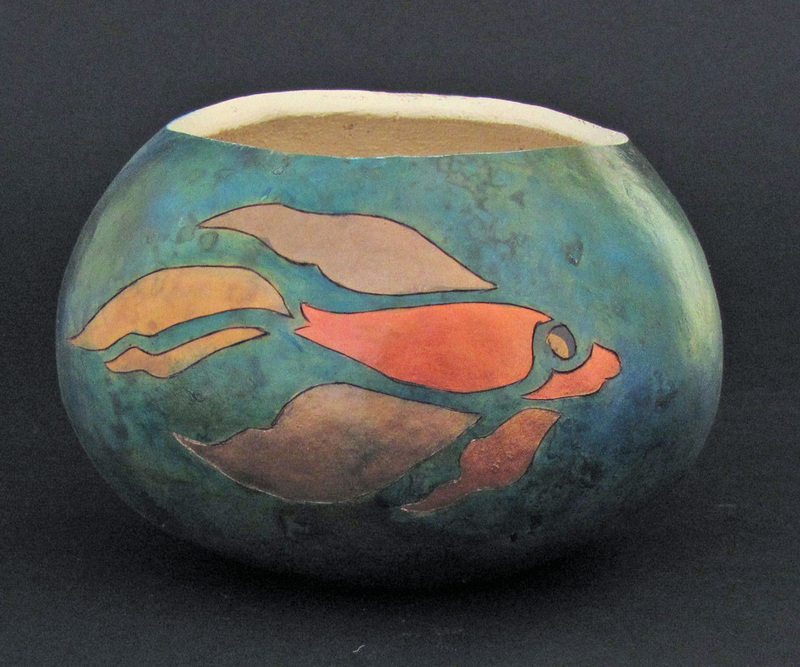 Pretty little bowl handpainted with a mix of blues and highlighted by a woodburned and handpainted fancy goldfish. 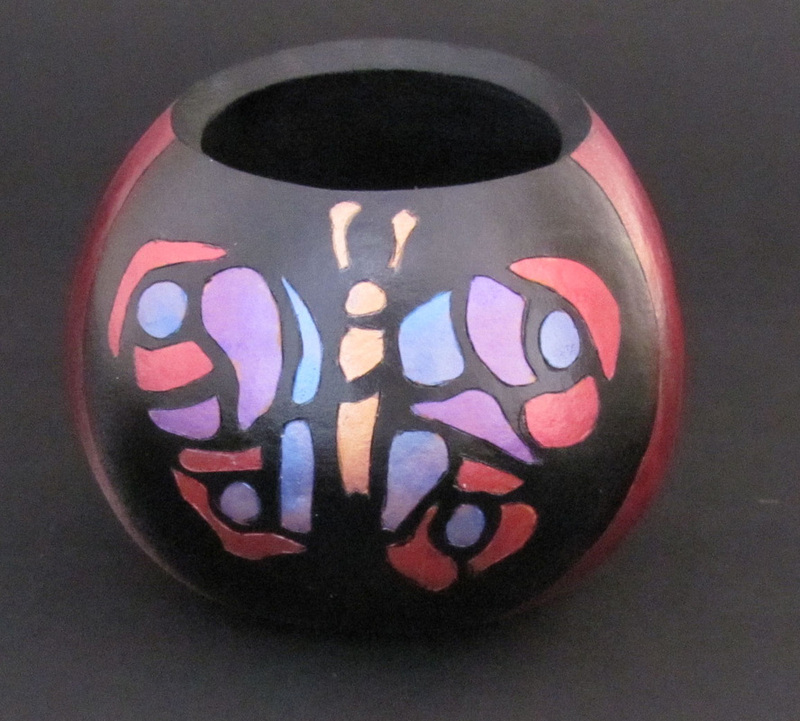 Brighty colored butterfly is woodburned and handpainted onto this little bowl. 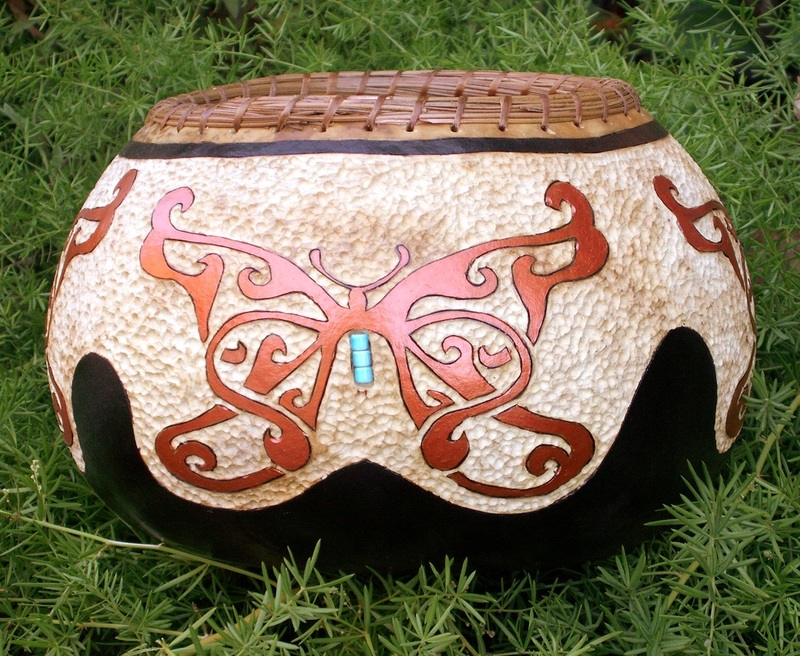 Hand painted and embellished with a carved bone button. 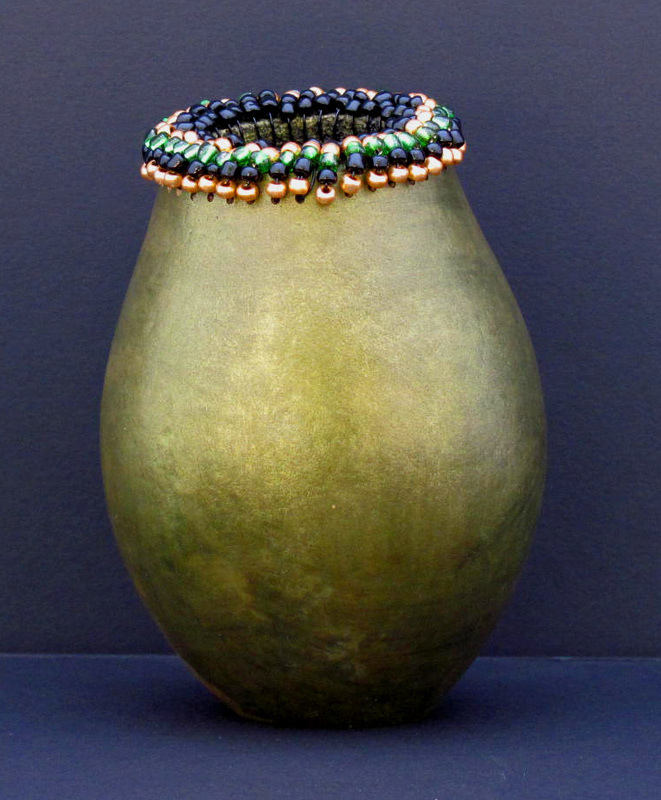 Classicly shaped and handpainted a beautiful sage green with subtle hints of gold. 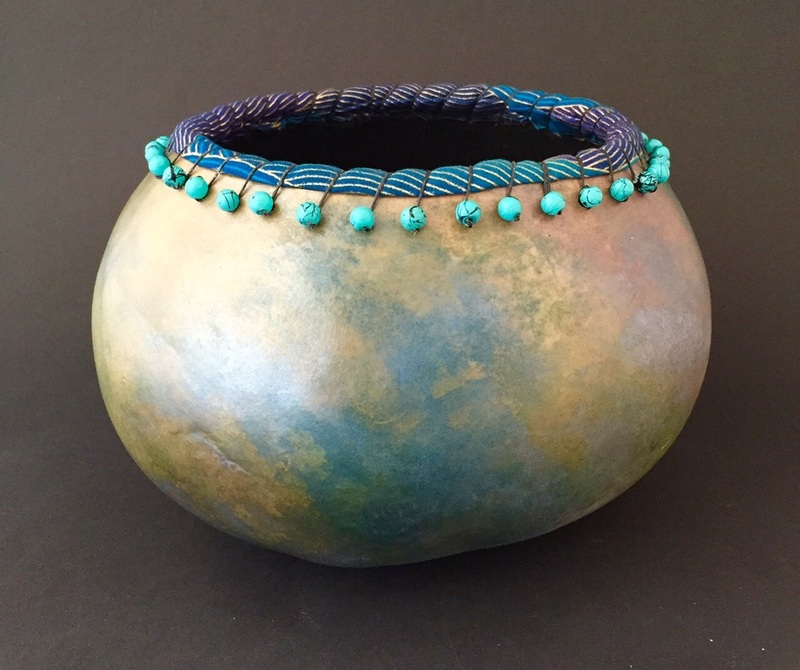 Trimmed with a painted band of silver metallic to match the silver charm set off by a dark brown rim. 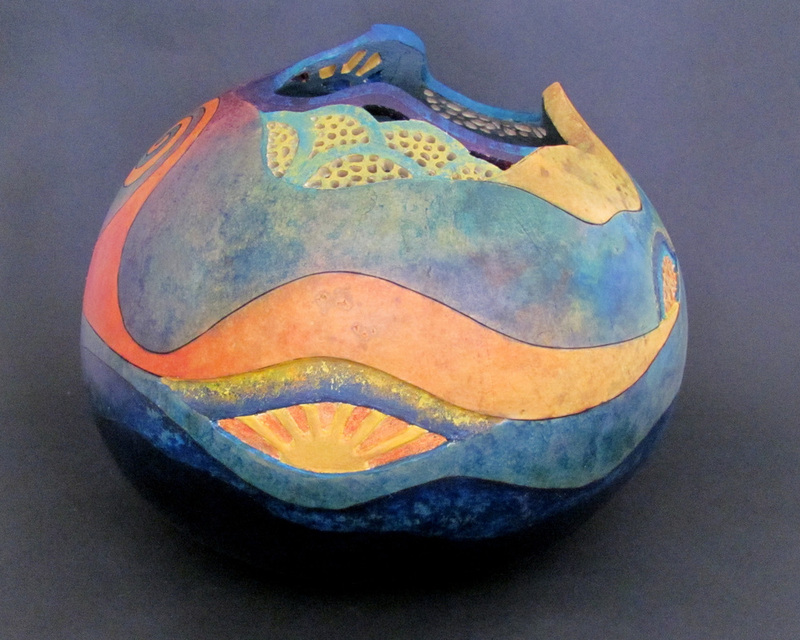 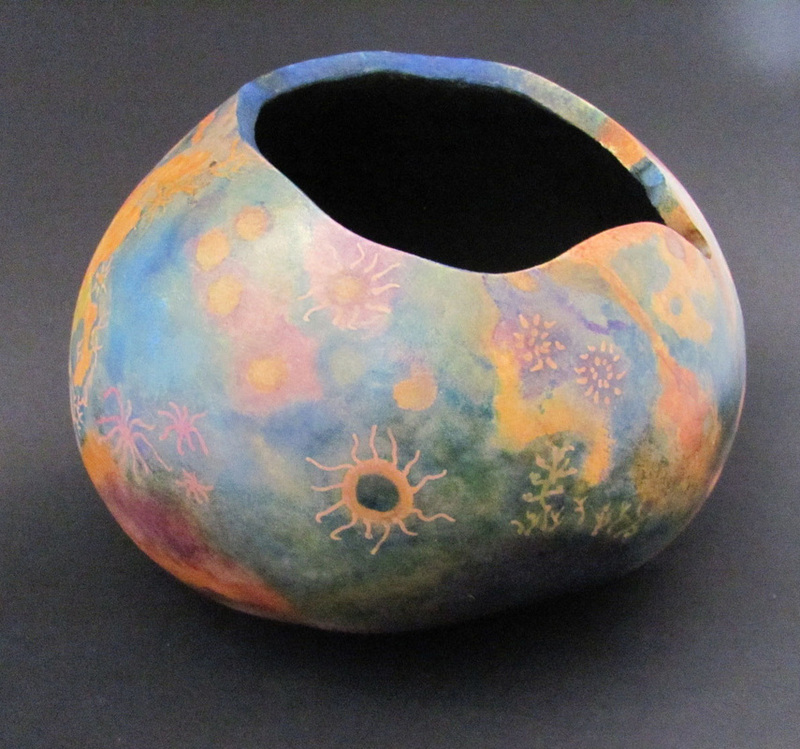 Bowl is painted in beautiful undersea colors. 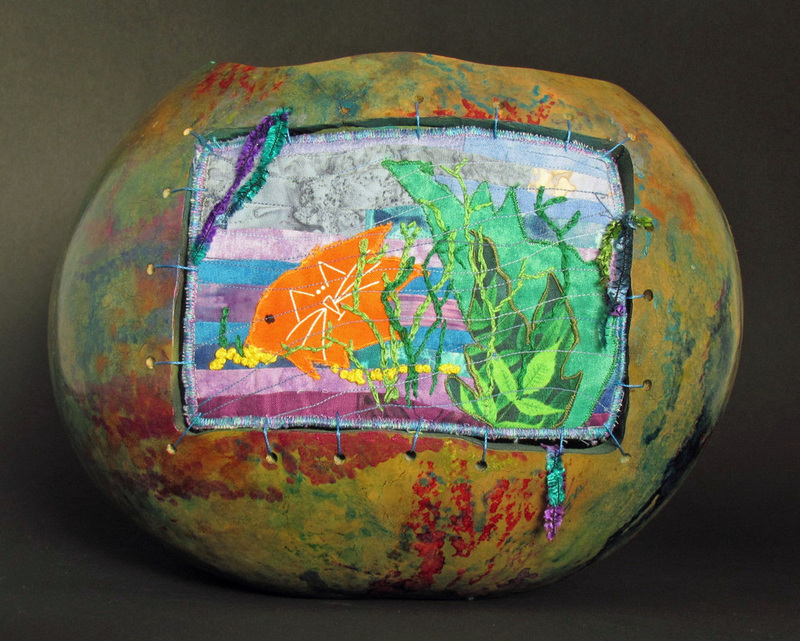 Inset is a mini-quilt with goldfish design. 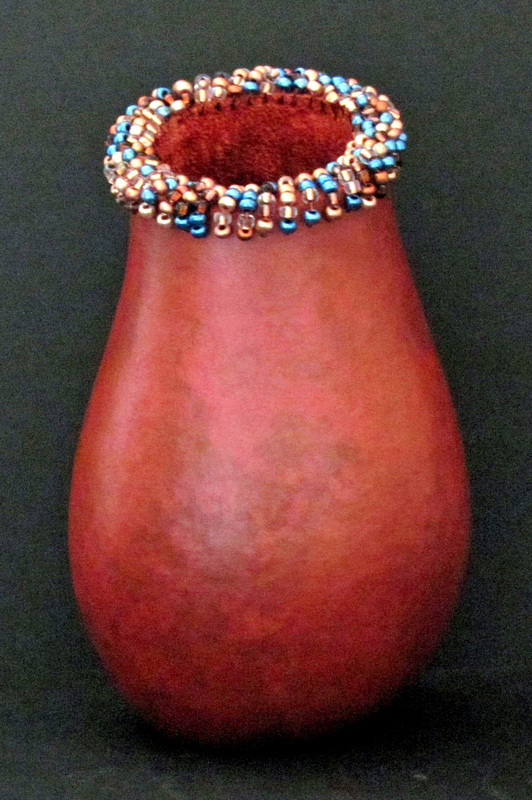 Curved opening accented with beads and stipple carving. 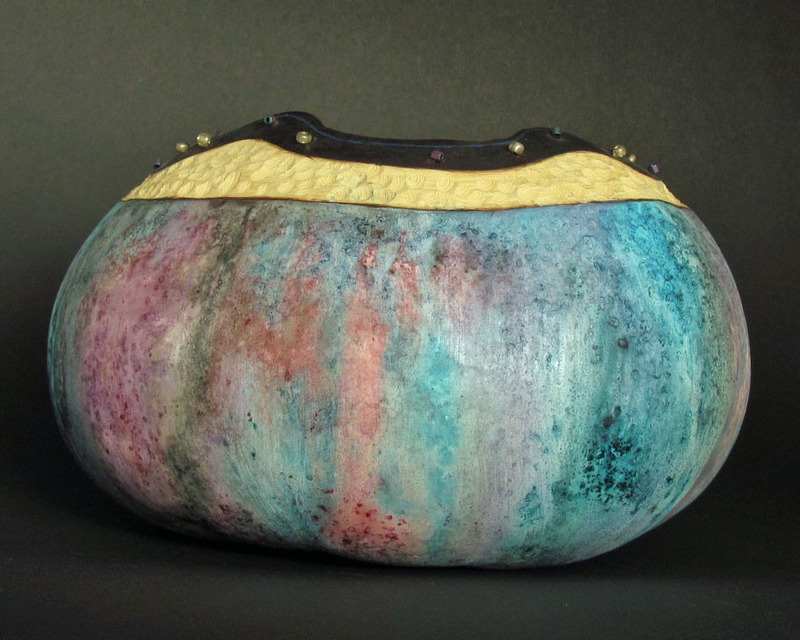 Silk dyed coloring in shades of blue and violet. 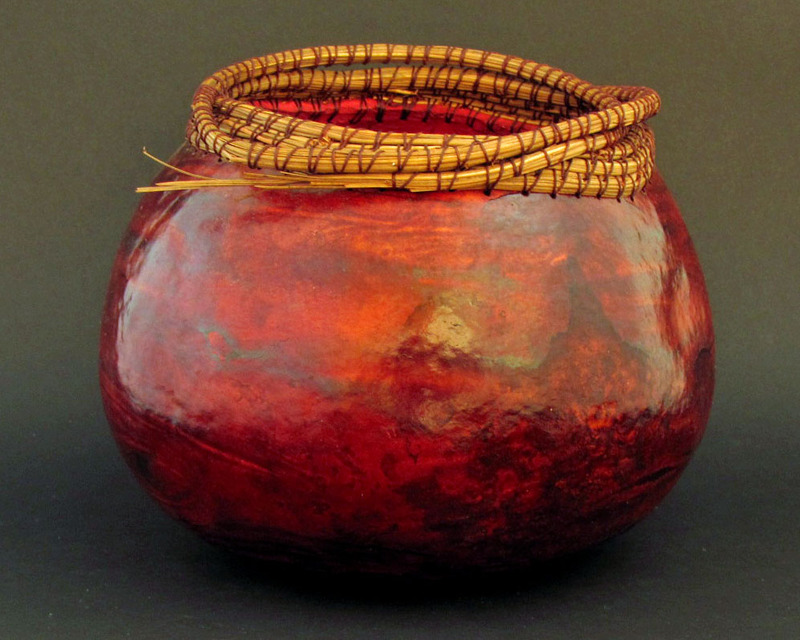 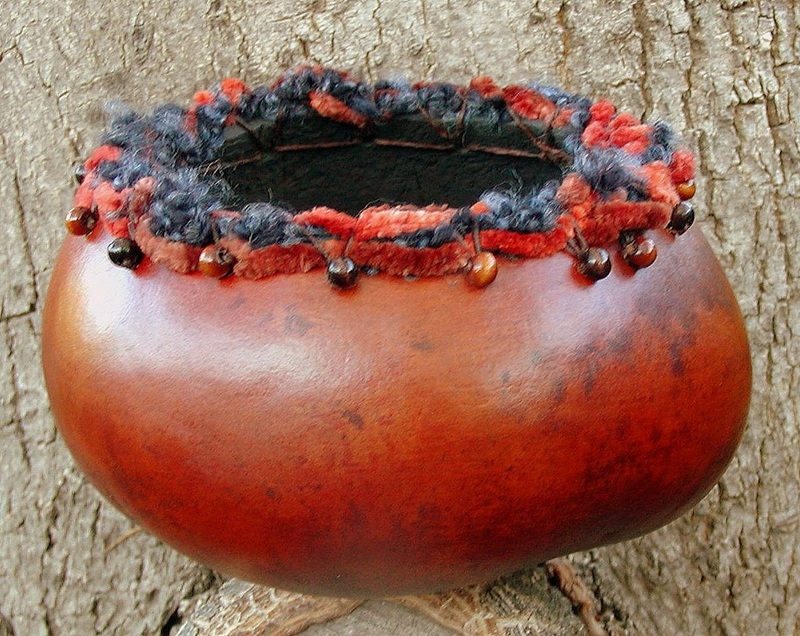 Simply painted with ink dye, this little bowl's rim is decorated with fiber and beads. 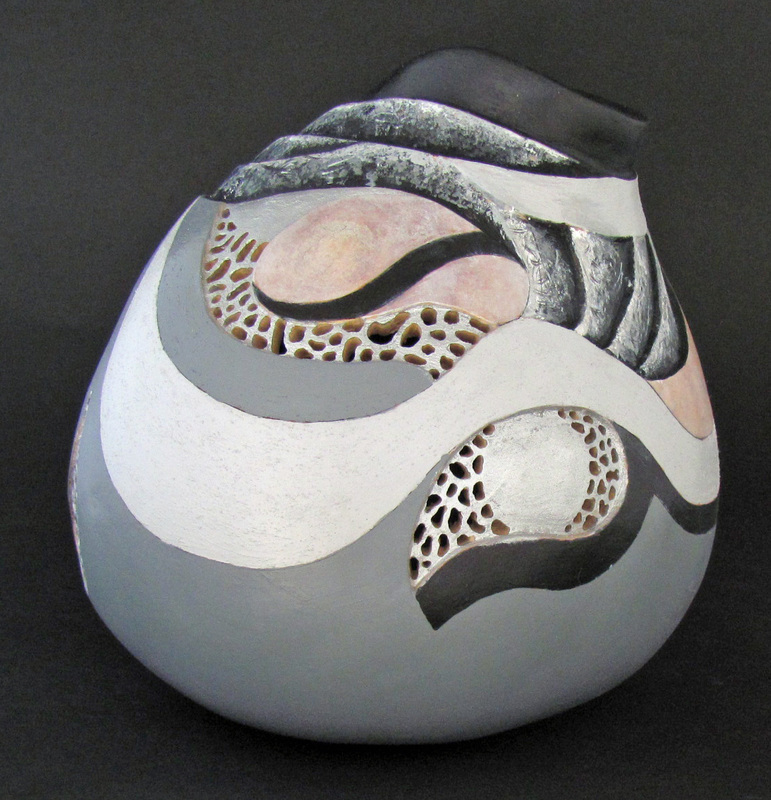 Lacy design on white "paper" background created with resist painting technique. 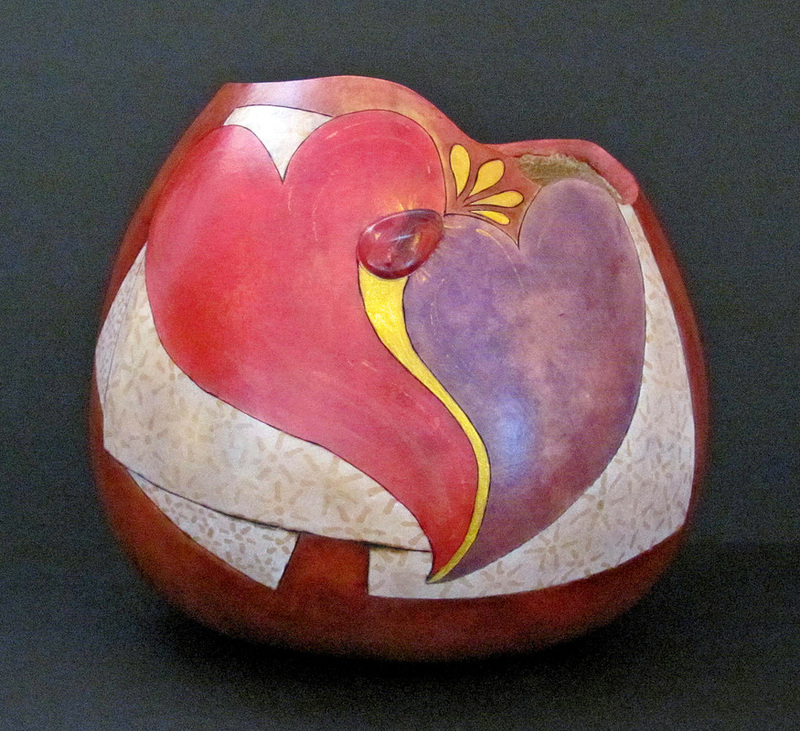 Red and purple hearts meld together, inlaid red and purple dichroic glass.